Follow us at http://twitter.com/dee_oclub . 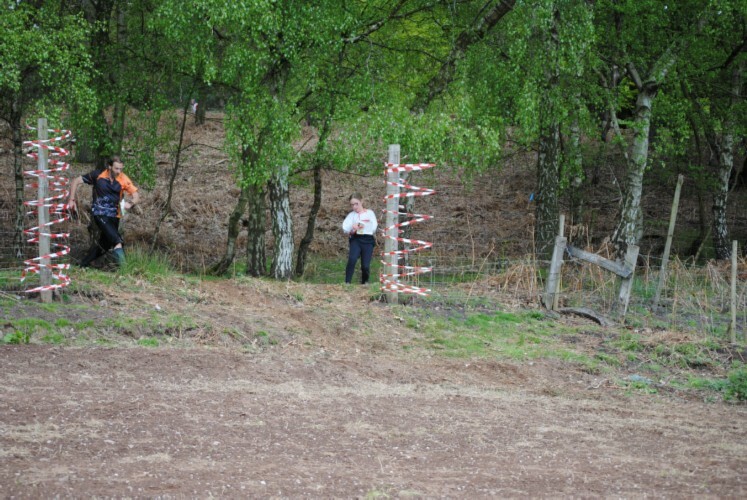 This is a new national competition for 2011, for M/W35 upwards. Full details here and on the BOF website. 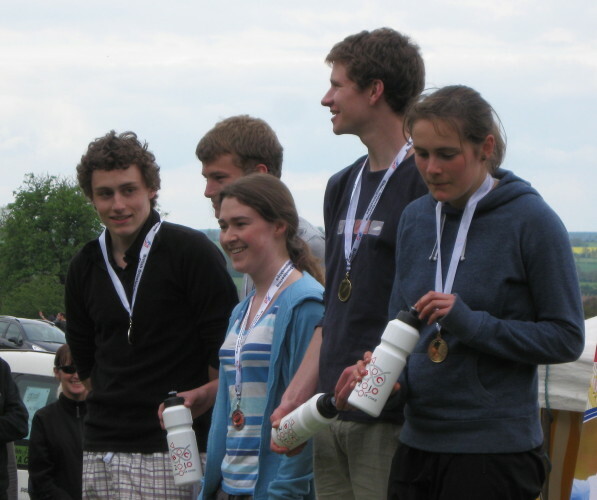 Congratulations to Olly Williams M16 and Sara Campbell W45 on their selection for the England Team for the Interland Cup 2011 on 6 March in Lübeck. 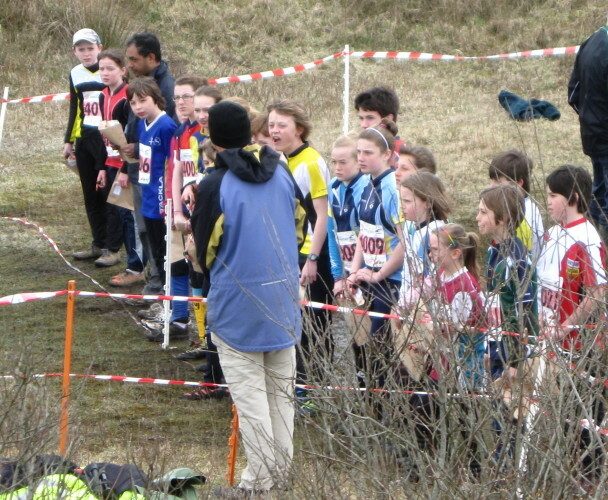 It has been confirmed that DEE will compete in the CompassSport Cup heat at Watergrove on 16 January 2011. More details on the SELOC web site. In case you hadn't spotted it, World of O are again running a daily "Route to Christmas" with selected top-quality legs for you to think about, plot a route, and compare your choice with others. For Day 16 they have chosen to show one of Pete Owens's Caw Specials - controls 6 to 7 in course 3. 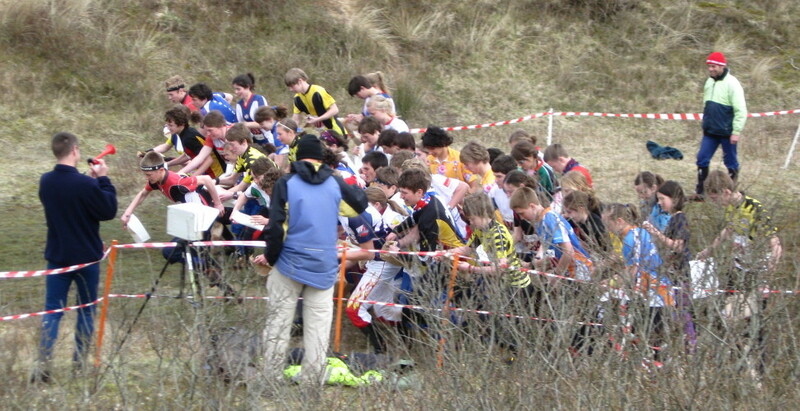 Fixtures and Rules for 2011 are now published. The thing you have been waiting for all year is now available - the provisional results for the NW Regional League. Note when looking at these tables: you will need Microsoft Excel or OpenOffice.org calc. For reasons unknown to your web editor, the Autofilter feature (that enables you to, for example, see just the DEE competitors in the league) works in Excel, but not in Openoffice. DEEsiders will be delighted to note that Chris Smithard heads the Senior league table, and Hannah Hateley is 2nd (or equal first?) in the Junior table. They are based on BOF Ranking points for M/W18+, and on a "countdown" scoring system for M/W16- (100 points for 1st, 99 for 2nd etc). The results are provisional because there were many inconsistencies in the source data. 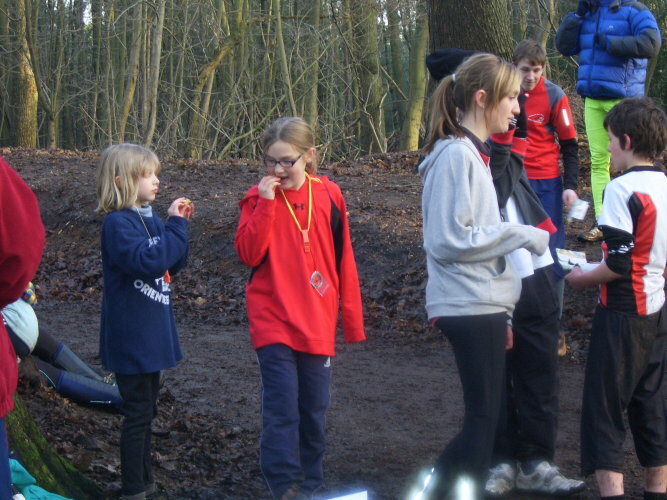 You can report any anomalies to The NWOA Fixtures Secretary (fixtures@nwoa.org.uk) by 18 December please. Because of teething problems with the League, and as no interim league tables have been published during the year, the recent NWOA Club Delegate Meeting decided not to award any prizes for 2010. 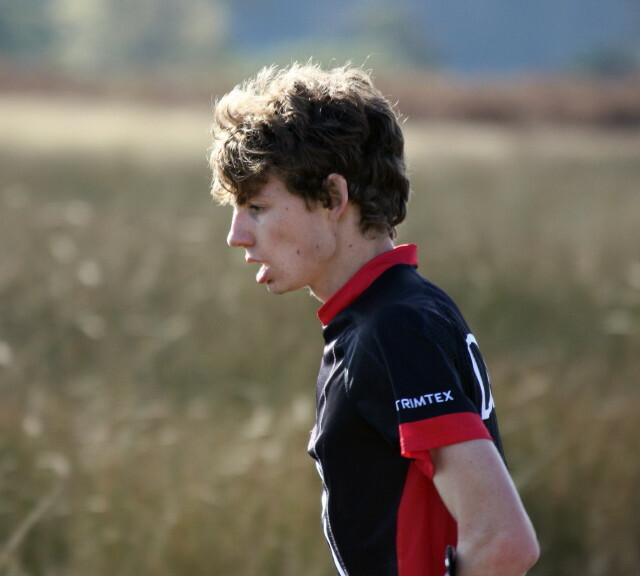 Congratulations to Olly Williams who won the Year 11 Boys class at this year's championships in a close race with most/all of his usual rivals. Unfortunately due to the date being too close to exam time next year, there is to be no England M16 team at next year's World Schools Championships so this result won't give him a chance to be selected for that. Full results on Mike Napier's website. Our former member Rachel Findlay-Robinson draws our attention to ShUOC's very deserving charity fundraiser on 27 November. Tom Beasant, Chris Smithard and Dave Schorah will all be involved, so give them your support on the ShUOC website. Following the leaving of 4 of our 5 first aid boxes out in the rain at the Sandstone Trail, the request of the St John's man at Caw has been achieved. We've rescued what we could and added extra items which overload our existing boxes so we've now assembled 2 kits - one in a translucent slightly green plastic box and one in the small dark blue toolbox which we used to use for results envelopes. These are water-resistant but I doubt they are waterproof. I think there's a message here for event officials and helpers - keep 'em dry [Ed]. 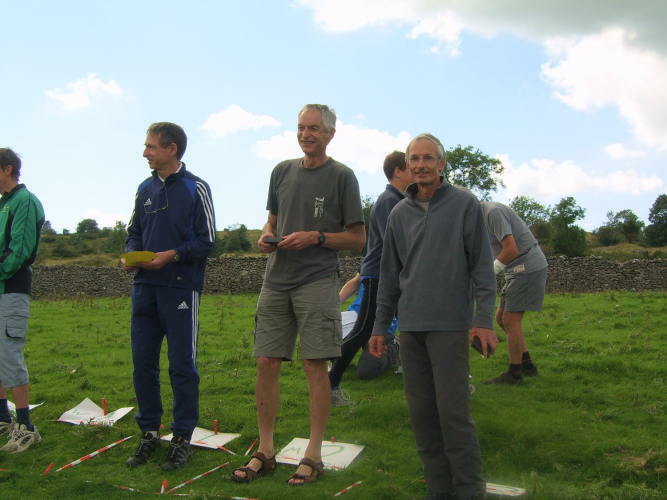 North Gloucestershire Orienteering Club has just brought out an orienteering board game. Any profits (at least half the purchase price) will be donated to help flood victims in Pakistan. Please contact Alan Brown of NGOC, if you want any further information. 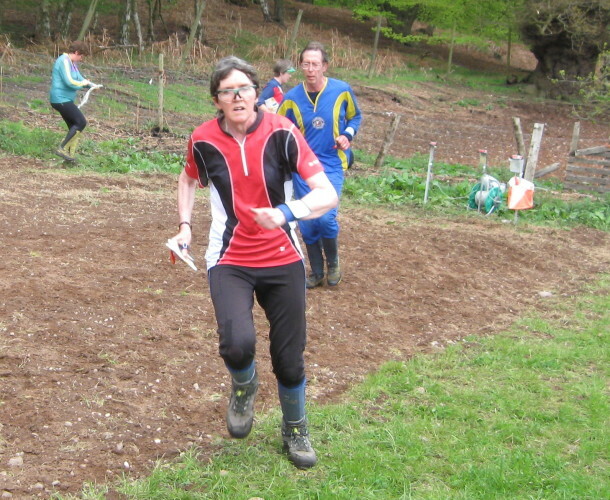 Carol McNeill's new book about orienteering is now available. Where from: Crowood Press, Amazon, Harvey's and other 'O' shops. Contents: Basic skills, advanced techniques, practical information on training and up-to-date input from Graham Gristwood and Pippa Archer. Over 200 maps & photographs in full colour. 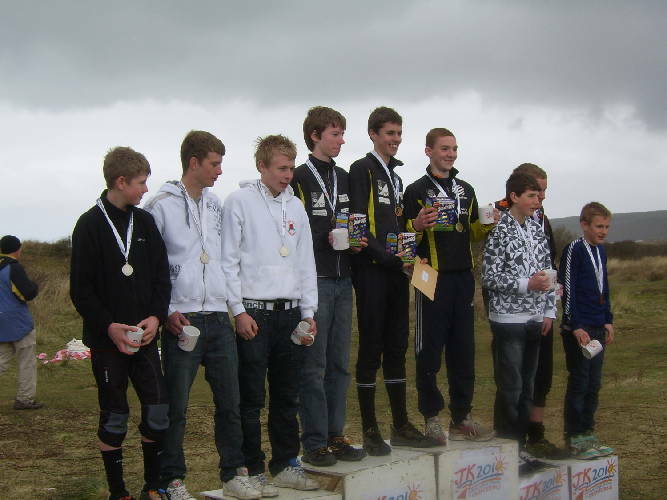 In the CSC Final at Burbage, SYO BOK and OD took the podium places, with DEE coming fourth. Well done to us all, a very fair (good) result with quite a few of us up at the top of the results with good runs and 1 or 2 disappointed not to be up there also. Colds etc knocked a few out of running today. Looking at the results, the terrain obviously had an impact on the times of some with some 'cleverly' placed controls needing you to be certain you were in the right place to find them. Massive rock pillars and blocks shown as the small boulder symbol confused some, making re-location very difficult. 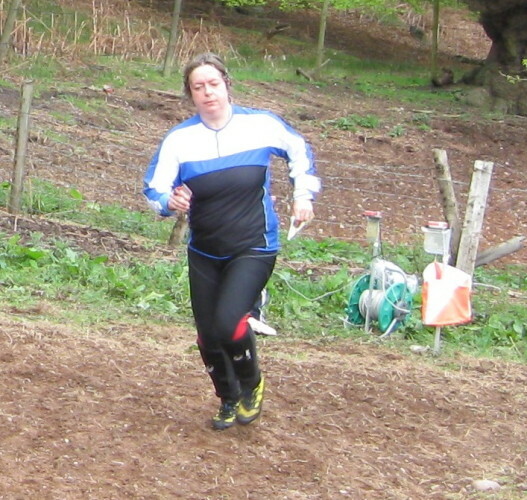 But lots of 'I won't count' runners did - who can tell till afterwards? 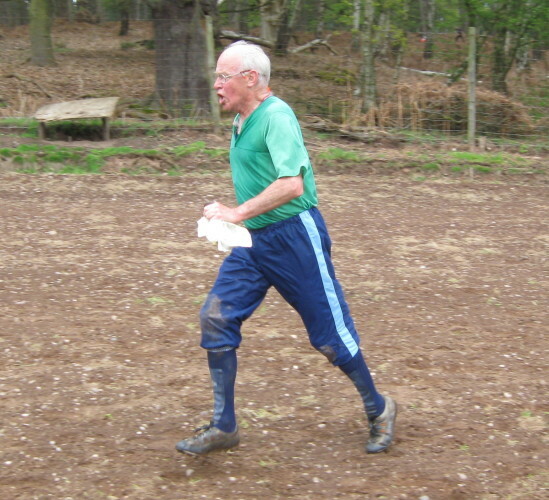 It looks like the evolving changes to the club's age structure are benefitting us in this competition so, if everyone is available for the heat and final, we should do well again next year - when the final is just across the road from today at Longshaw. Full results, RouteGadget and SplitsBrowser here. 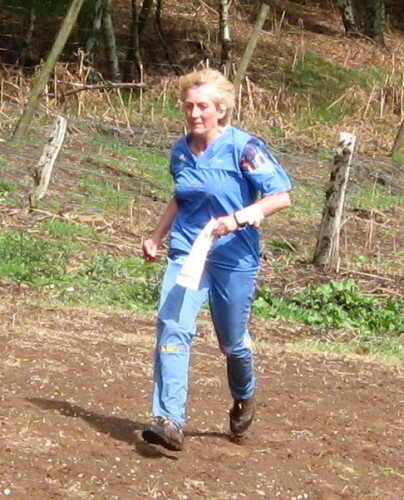 In the heat at sunny Tockholes on 10th October, LOC and DEE finished equal on points. LOC win as their next counter was 5th and ours was 6th - Emily Davies tied with Chris Owens and Sam Drinkwater with 95 points so she was also in the counting team. So LOC and DEE are 1st and 2nd and, with 5 complete teams running, 3rd place also qualify because DEE were in the top 5 in last year's final so SROC go through as well. All subject to official confirmation. Well done to all: it's a fantastic result as only 8 of last year's 20 runners in the final were running today out of our 19 runners. Keep Sunday Dec 5th free for a trip to Hawkbatch, Shropshire!!! 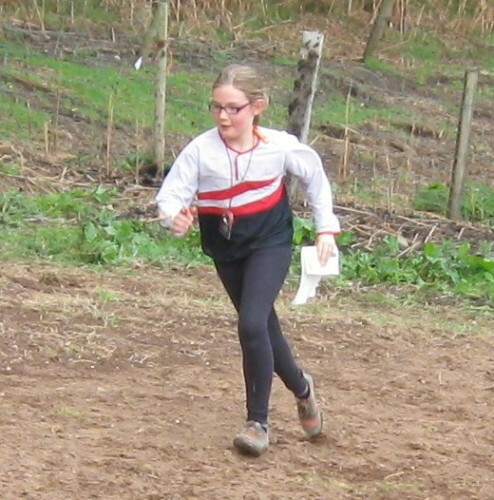 Congratulations to Hannah Hateley, who finished second in the Year 5 Girls class at the British Schools Score Championships in Blackburn. 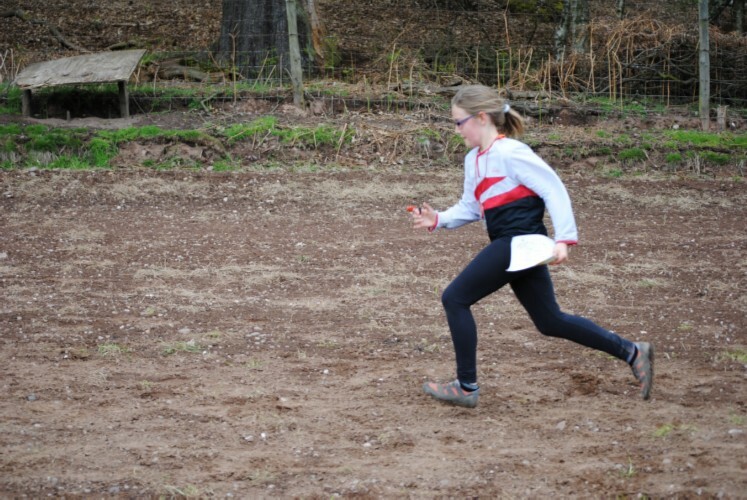 In a 45-minute score event, Hannah's safety-first run gathered her 150 points with 12 minutes to spare, just 30 points behind the winner. 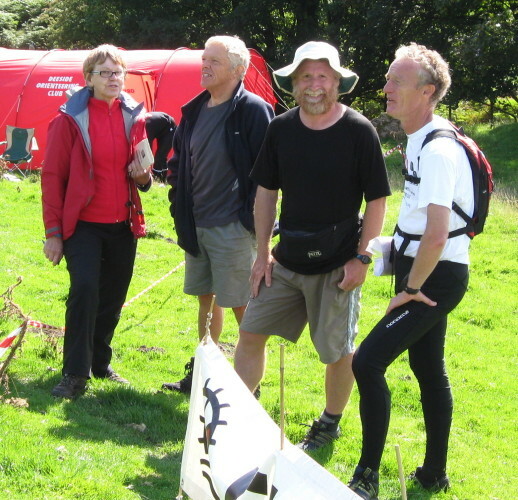 Chris and Mike, plus Graham Sutton, who secured 2nd place in the B Team Prize for DEE - pretty good for an orienteering club in a fell race! and to all the others who ran. Hidden away on the BO website (and undated), the British World Class and Talent Squads have been re-selected for the next year and Chris Smithard has been moved up into the main squad along with Jamie Stevenson of FVO - not to be confused with his namesake who has recently retired from the squad! 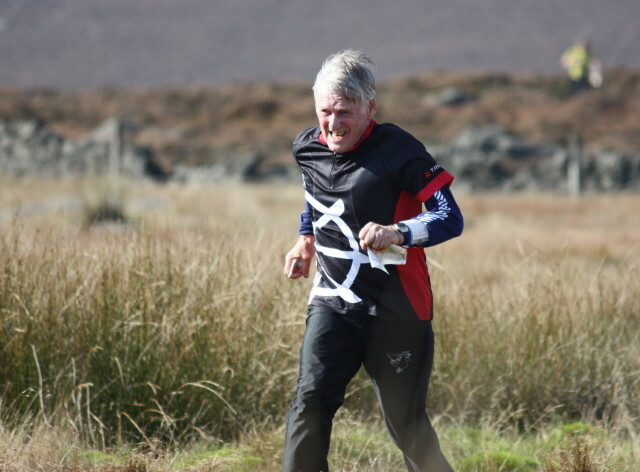 Well done to Chris who has trained hard over the last year and now feels that he is more competitive against the top runners physically (though perhaps not so much over rougher ground?). There are 19 males in this squad which is divided into 3 separate levels not identified on the BO website based on past achievement and expectation of selection for and achievement at the World Championships and World Cup races either in the immediate future or in a few years' time. Chris is based at the Sheffield Centre of Exellence and receives financial support for full-time students (the TASS scheme) for training and competing together with training advice and target and programme setting. 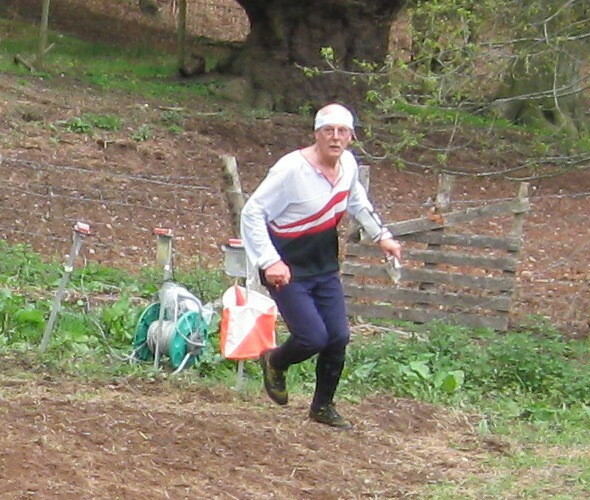 This new level of fitness was demonstrated at the Sandstone Trail B race last weekend where, by the time he reached the drinks point at Beeston Castle after less than 5 minutes, he was so alone that his mum asked him if the race had started! 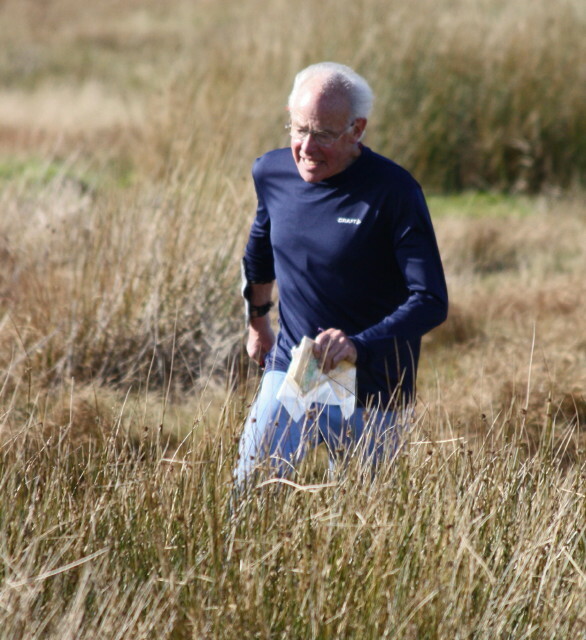 The conditions no doubt slowed his time down somewhat (4 - 6 minutes for most who ran last year) but his time of 67 minutes was sufficient to set a new record for this course. The DEE Web Team are now tweeting at http://twitter.com/DEE_OClub. We'll be mostly using Twitter to announce updates and the like made to the website. However, the Tweeting Members may wish to use the moniker as an additional means of co-ordinating membership communication; I guess we'll see. Anyone wishing to run at this event on 17th October near Sheffield, please let our Team Captain Mike Smithard (smithardm@btinternet.com) know asap, if possible on/before Friday 1st Oct. Details available from Mike. 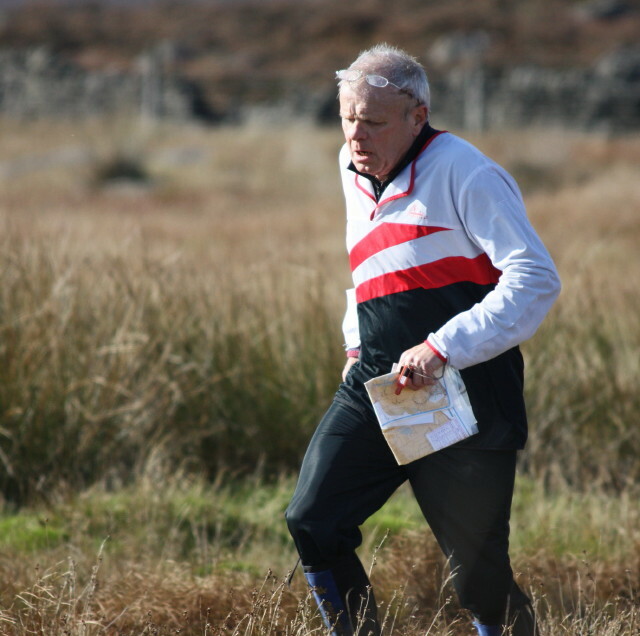 British Orienteering Staff and Directors are taking to the road to visit all 12 Associations and give members an update on current projects within orienteering in the UK. Roadshows will cover the Competition Review, the 4 tier event structure, plans for the future development programme and more. The North West Roadshow will be held on Tuesday 26 October in Preston, and all members are welcome. For further details and pre-registration form, see the Roadshow Flyer. 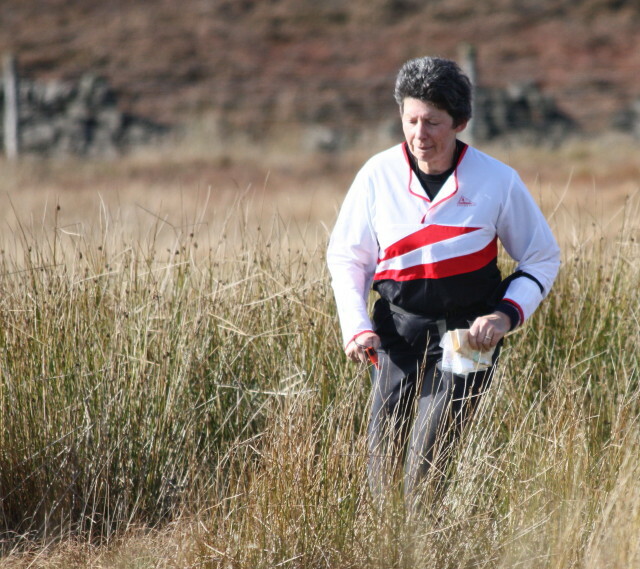 Lynne Thomas, BOC 2012 Co-ordinator, is looking for Organisers for both days of the British Orienteering Championships, to be held in the Lake District 5/6 May 2012. If interested please contact Lynne Thomas (lynnethomas99@yahoo.co.uk) as soon as possible. 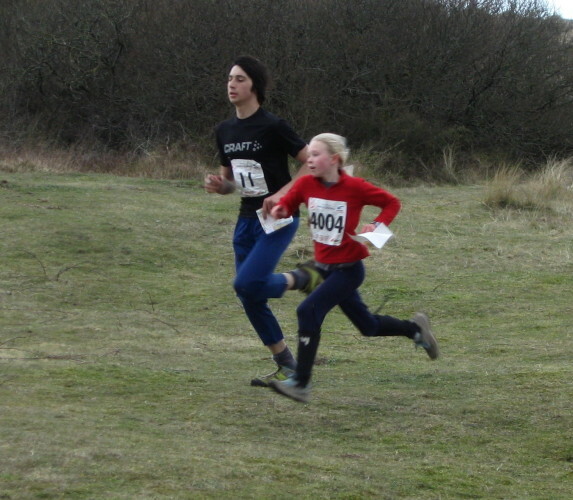 The latest revised, corrected provisional results show DEE winning the heat at Formby, finishing 32 points ahead of MDOC. 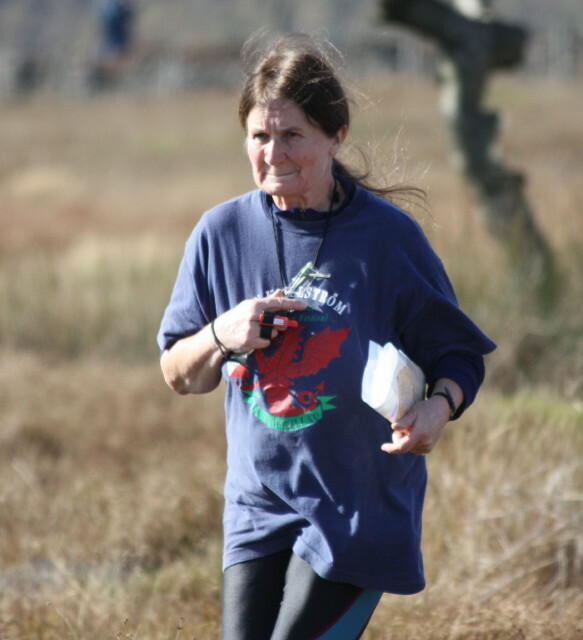 Thanks to all the runners for your efforts, commiserations to those who had problems and well done to those who succeeded - I'm sure some were surprised on their counting for the team but it all depends on who turns up and how they run! After several years of being beaten into the ground, our uni lads (and Liz Hughes - almost ex-uni) turning out for us turned round our fortunes. Especial thanks to them. 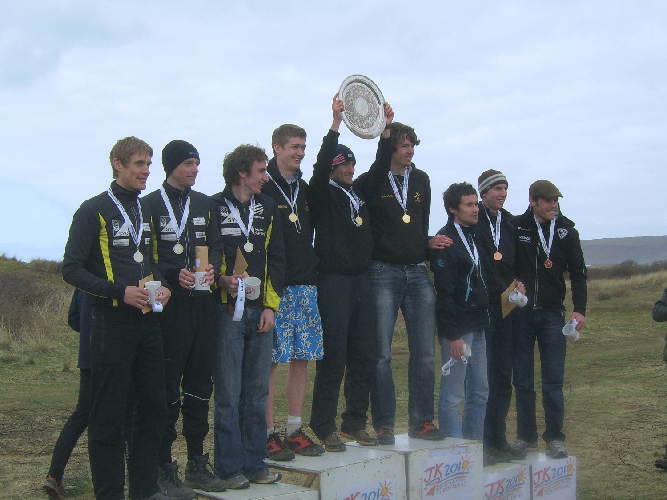 The "uni lads" did us proud: Dave Schorah, Chris Smithard and Tom Beasant came 1st, 2nd and 3rd in the Open class (Brown course); then Chris Owens was the next counting Compass Sport Cup finisher, so that got us a fantastic 394 points. 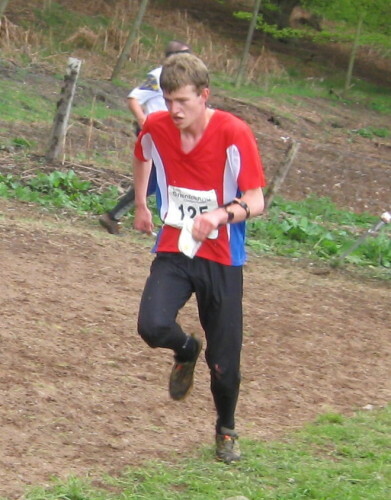 Other top scorers, each with 100 points, were Will Bell in M14-, Olly Williams in M18-, and a certain M Smithard in M60+ who romped home 9 minutes ahead of his nearest age-class rival. Full results on the MEROC web site. 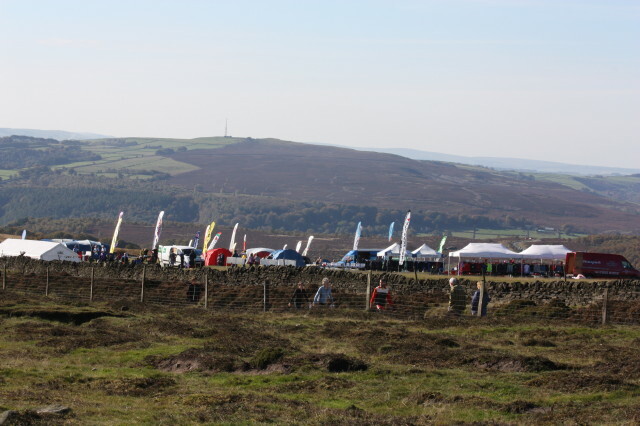 The Final is on Burbage Moor on Sunday 17 October organised by SYO. IOG (Istanbul Orienteering Group) invites you to "Istanbul 5 days Orienteering Event" which will be held in Istanbul, Turkey on 2-7 November 2010. This is a multiday o-event taking place in two continents (Europe and Asia); in various parks, forests and even in the maze-style streets of huge and ancient Grand Bazaar in Istanbul. 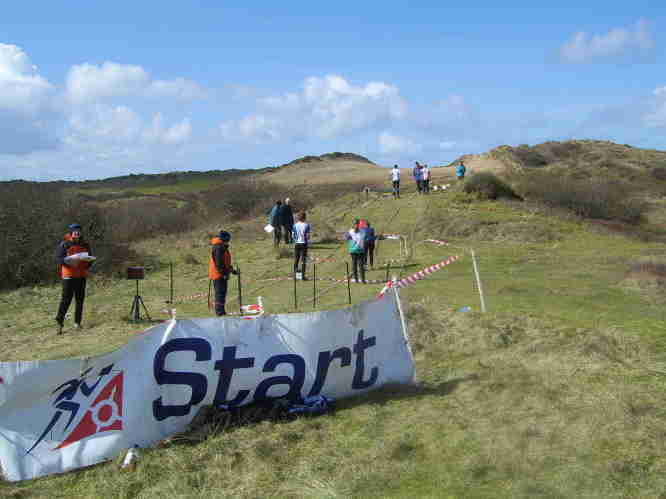 On November 6, the day will be a WRE (World Ranking Event) where many famous and professional runners will compete for. In our website http://www.ist5days.com/, you can find all the information about the event, accomodation possibilities in the center of old town, transportation, participation fees and more... Bulletin 2 is already released and Bulletin 3 is on the way coming soon! You can also register online for the event in our website! We are looking forward to see you in Istanbul and hope you will experience a wonderful time and orienteering experience in one of the oldest and most beautiful city in the world! Opportunity in Chester to dust off your badminton rackets! Cheshire West and Chester Council Sports Development are launching a Back 2 Badminton scheme in September. 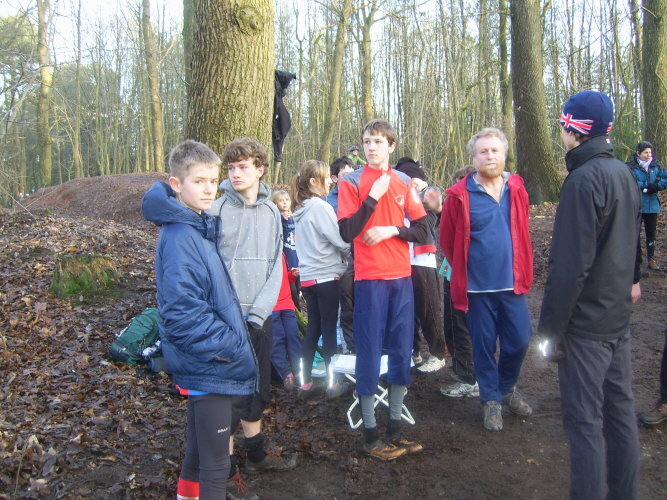 The scheme aims at reintroducing adults to the sport by running a series of coach-lead training sessions. Although the sessions look to develop the basic skills of badminton, this is done in a fun and friendly environment. 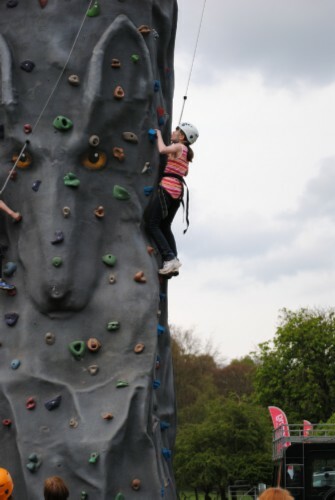 For further information please visit www.cheshirewestandchester.gov.uk/back2sport. Calling all apiring netballers - players, Mums, sisters, relatives, etc. Cheshire West and Chester Council Sports Development are launching an additional two Step Back 2 Netball schemes in September. 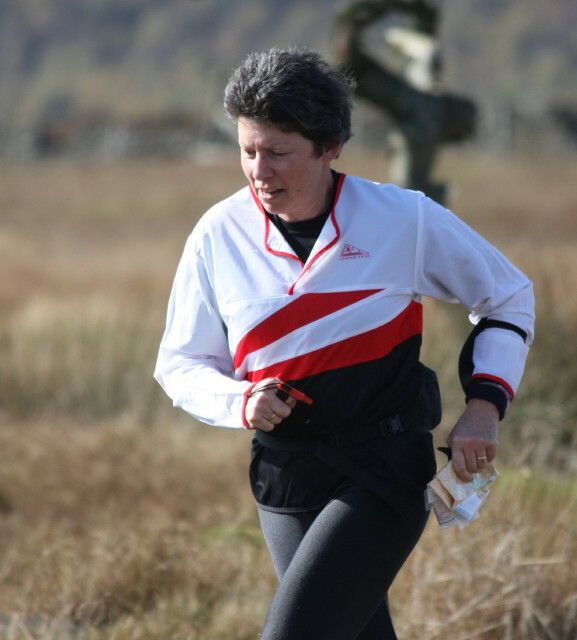 The scheme aims at reintroducing adult women to the sport by running a series of coach-lead training sessions. Although the sessions look to develop the basic skills of netball, this is done in a fun and friendly environment. 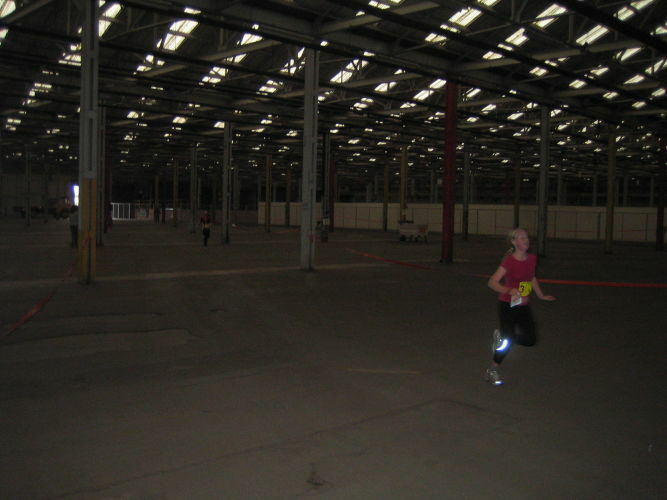 This year's Peter Palmers were held at Chetwynd Barracks, near Nottingham. 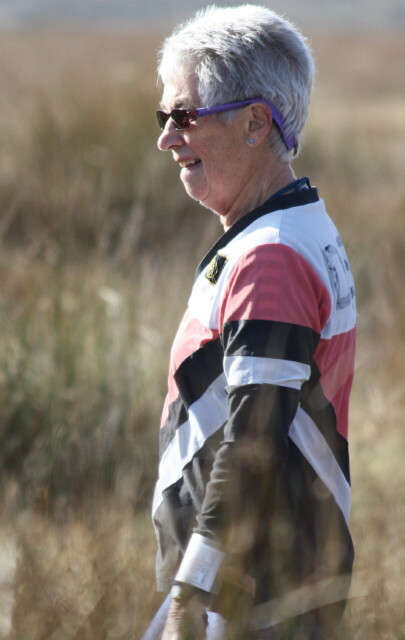 DEE sent 2 teams, 1 competing in the handicap class (sum of runners' orienteering ages equal to or less than 90) for the Joan George trophy, and 1 in the normal Peter Palmer trophy. 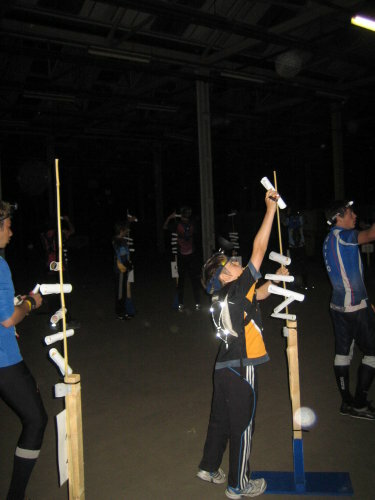 For those unfamiliar with this relay, it comprises 6 legs and is partially run at night, this year starting at 4:45 in the morning. 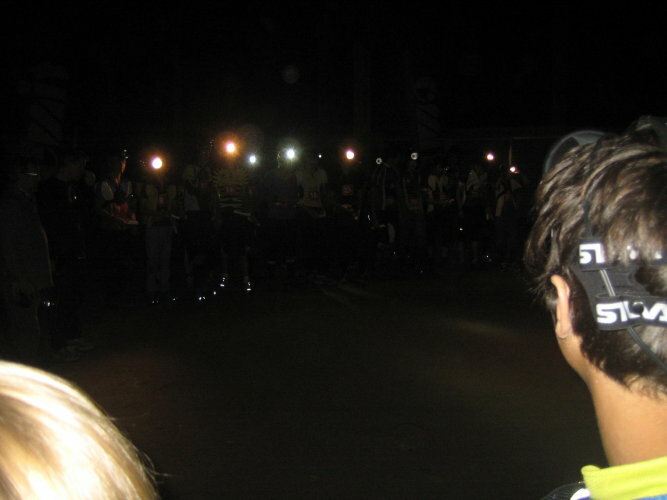 The first two legs are of red standard at night, leg 3 is light green in the dawn, leg 4 is an orange, leg 5 is a yellow and finally a green course for leg 6. The last 3 legs are all in daylight. 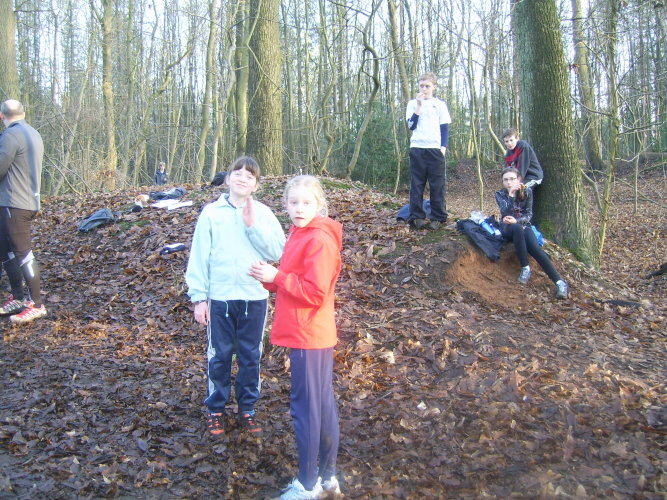 The area was mainly urban, a mixture of barracks with a few fields and three small patches of woodland. The start, finish and changeover were located inside a main hanger with the sleeping area just a few steps away in a sectioned off area of the hanger. This produced some very fast racing, with the fastest people averaging around 5.7 mins/km at night and just under 5 mins/km in the day. Care was needed to make sure you didn't get trapped by an uncrossable fence and that you were the right side of buildings. Reading your control descriptions became twice as important, not only to check the control codes but also to see exactly where on the building your control was located. Philip Vokes and Lachlan Chavasse started for our teams, Philip for DEEmons (handicap) and Lachlan for DEEwhizz. Both had good clean runs, but the pace was a bit fast for their little legs and so both teams dropped time on the leaders. Lachlan was probably the youngest competitor there, being just a 1st year M12 (the minimum age), plus having a December birthday, meaning he is still only 10. 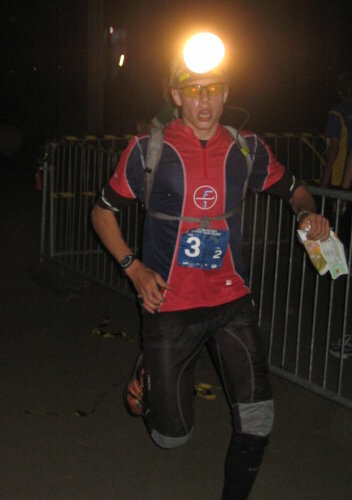 Well done to him for coping so well with this hard night leg. Philip passed over to Chris Owens 14 minutes behind the leaders, with Sean Pickering following on from Lachlan a further 2 minutes back. Chris had a storming run, setting the second quickest time for leg 2 and bringing the team up 7 places to 12th. 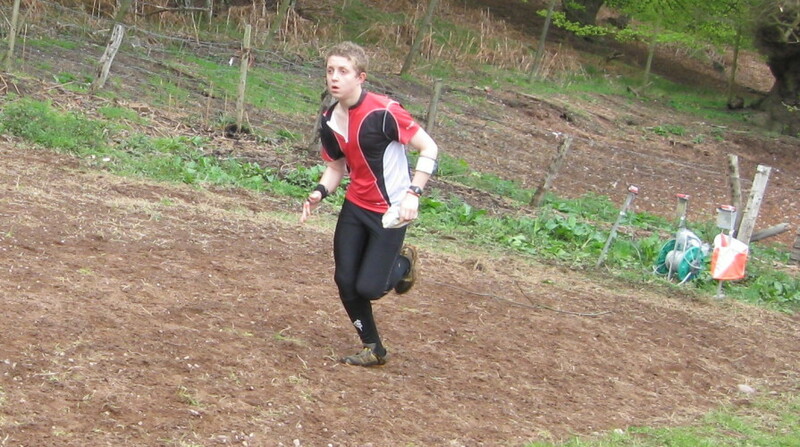 Sean had a steady run, like Lachlan and Philip, but still managed to gain 4 places to bring DEEwhizz up to 18th. 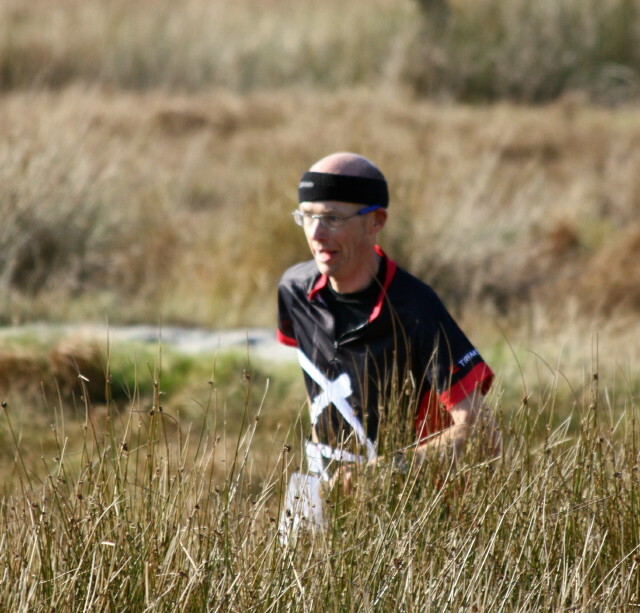 Olly Williams set off for DEEmons on leg 3 and, like Chris, had a great run. 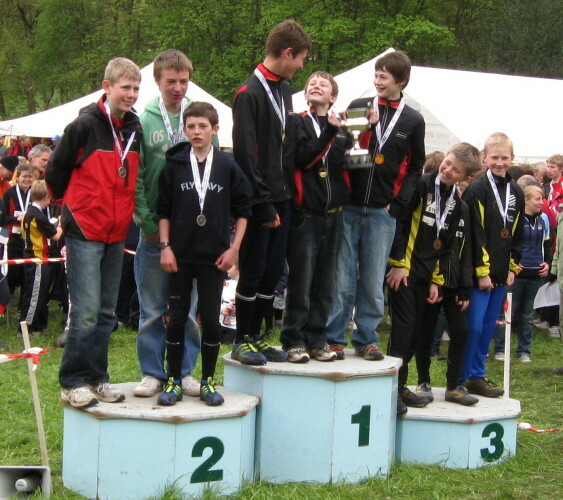 Olly loves this type of area, as he proved at the British Sprint Championships at Chorley a few months ago. 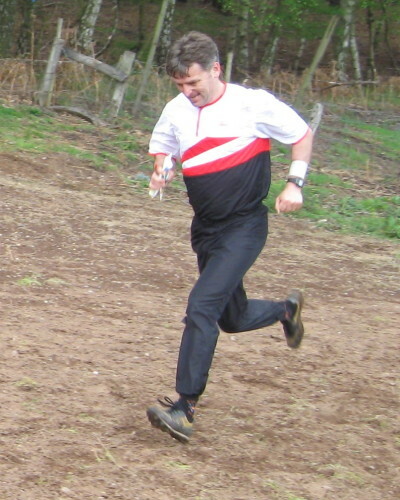 This showed as he set the fastest leg time by over 2 minutes, gaining another 6 places. 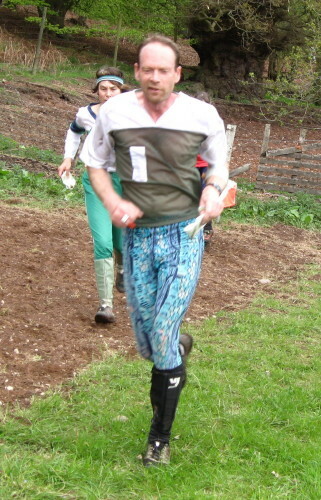 Will Bell took leg 3 for DEEwhizz and also had a clean run, gaining 1 place by the end of the leg. By now it was light, and Kitty Jones set off for DEEmons on the orange. 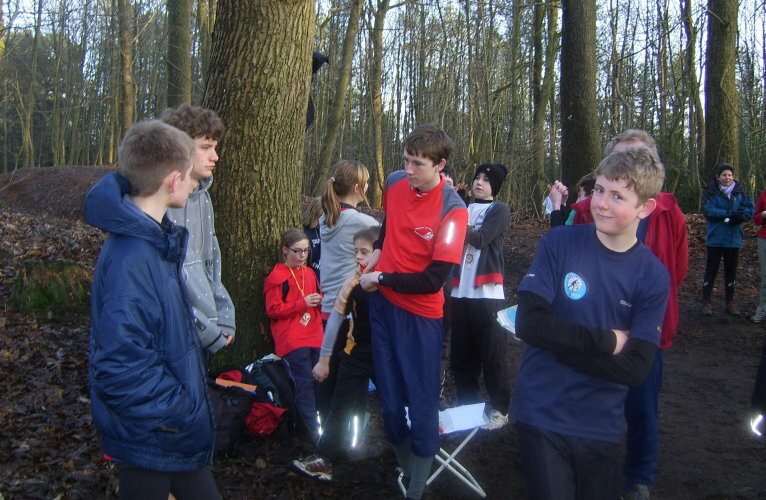 Not as quick as some of the runners from other clubs (1 club had a W16 who finished on the podium at the JK this year...), plus a few minor errors on a hard orange course, which saw the team slip a few places. 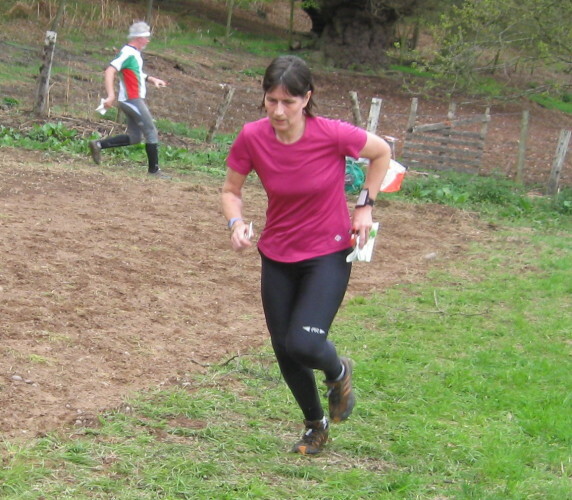 Helen Elmes had her usual steady run for the DEEwhizz team and so, two thirds of the way through, we were lying in 11th & 18th. 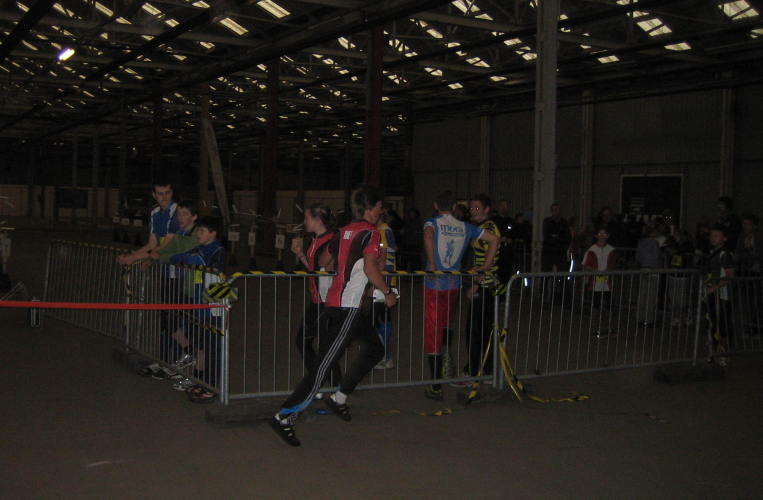 In the Peter Palmers you can run up to 3 people on the yellow course, and it is the fastest person who counts for the team. 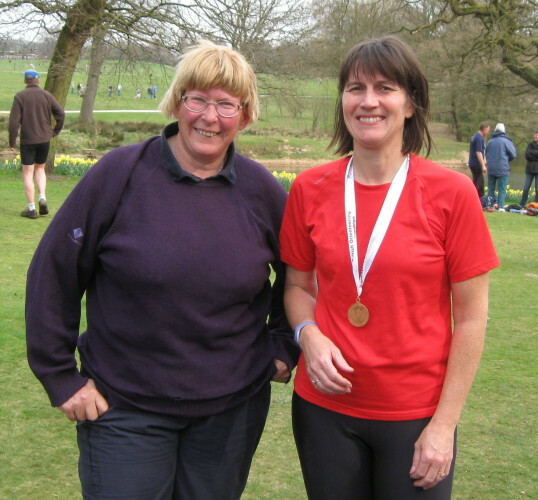 For DEEmons, Evelyn Elmes and Nina Jones went out together and decided that strength in numbers would be their best bet to set a fast time. Faced with a difficult yellow course, they made a mistake on their 3rd control, losing 8 minutes, but still came back with big smiles on their faces. 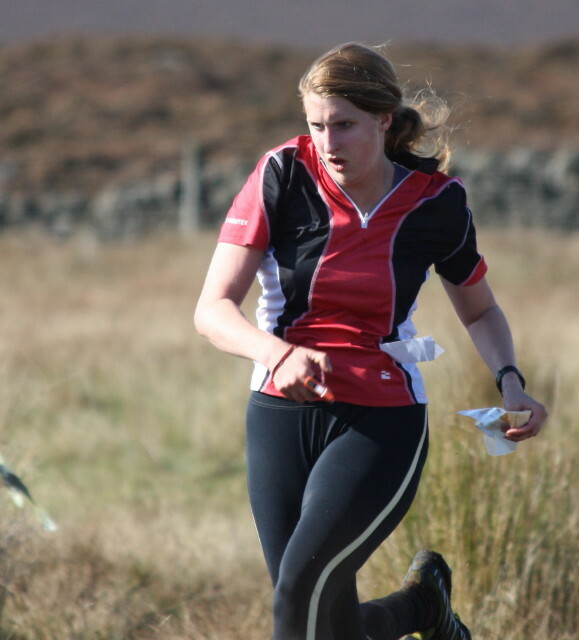 Hannah Irvine set a respectable time for DEEwhizz to maintain 18th place overall. 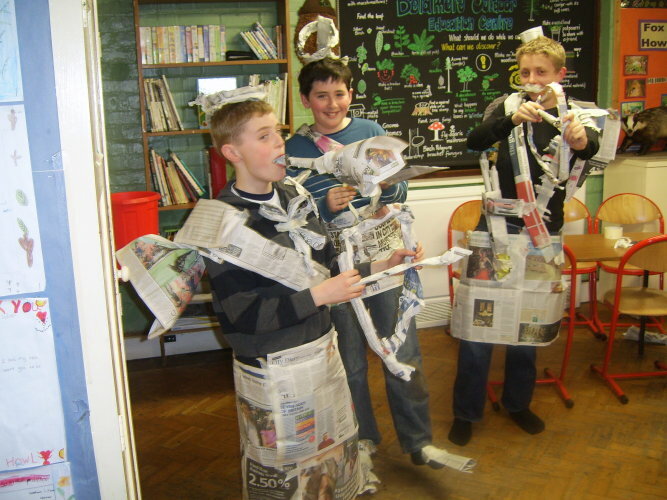 The last leg was run by Matthew Vokes for DEEmons and Aidan Chavasse for DEEwhizz. 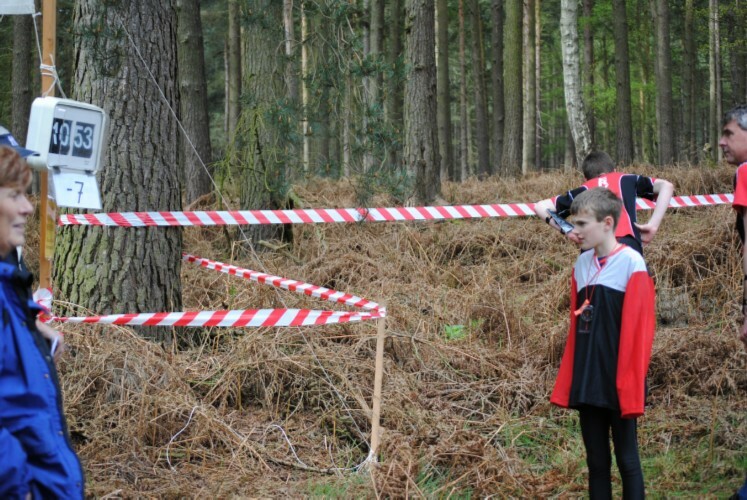 The longest of the six courses, it saw them doing multiple laps of the map - Matthew used one gate four times! 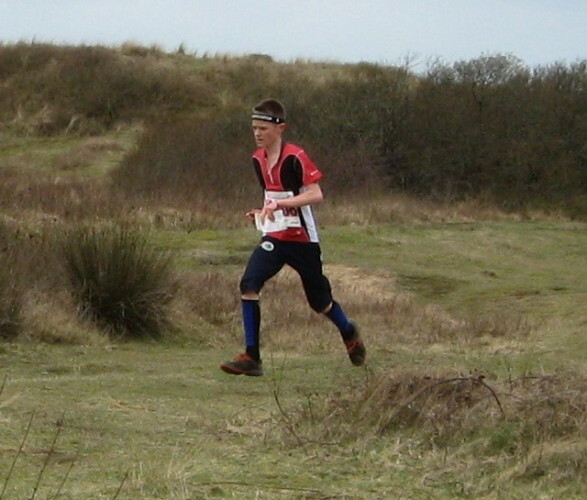 Matthew set a quick time, overtaking the WCOC runner on the last little loop to bring DEEmons home in 12th place (and 5th in the handicap competition). 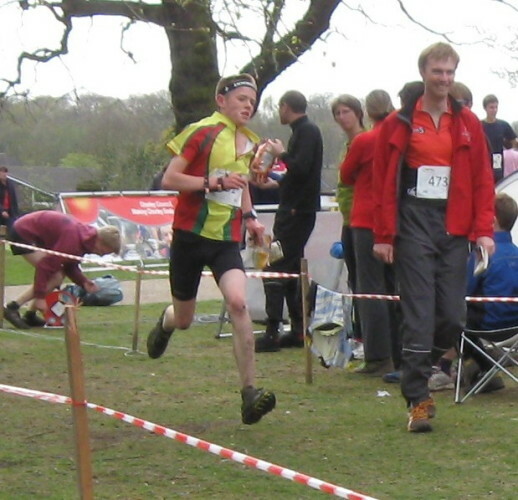 Aidan also had a good run, overtaking SYO and thus finishing in 17th place. 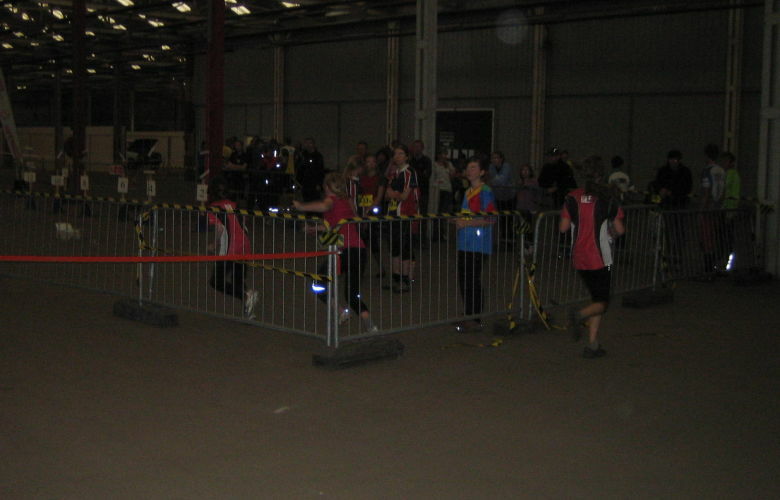 Overall, everybody seemed to have enjoyed themselves on this interesting area and nobody got the team disqualified by mis-punching - the worst crime possible in a relay! 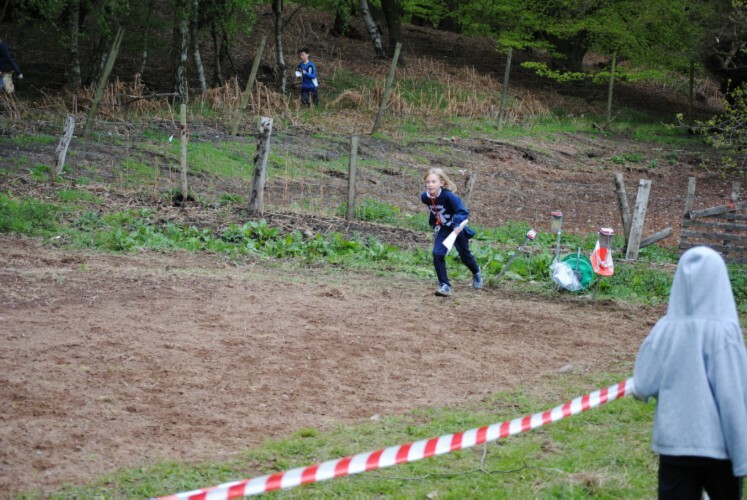 The longer courses especially were more tiring than usual as essentially they were 5 or 6km sprint races! SYO won overall by just under 6 minutes from OD. Thanks must go to the three willing adults who drove and supervised us all (as well as getting up at 4 in the morning! ): Bob Elmes, Paul Chavasse and Paul Jones. Thanks also to Mike Smithard who rallied the troops and got the teams organised. 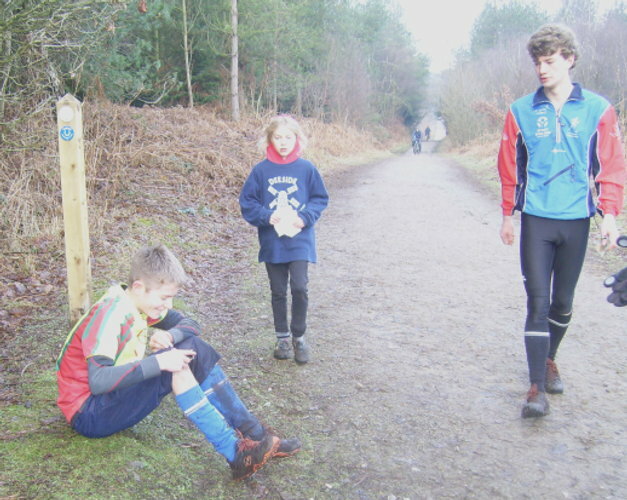 We weren't winners this time (except for Olly, who won a fetching CRAFT fleece for fastest leg 3), but there's always next time (probably Sutton Park)! Full results on Michael Napier's website. Robert Lines' photos on Picasa. 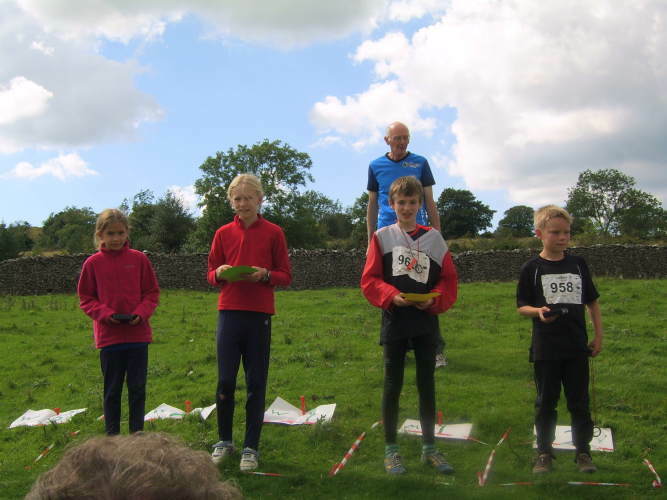 Hannah Hateley and Daniel Weaver swept the board in W and M10 at the Lakes, both winning 3 days of the eventual 4 days of races - but Daniel will have to improve - Hannah beat him each time (except when her shoe came off in the mud) though it was close on the last day! Coming home to of rain in Birmingham and mud in Reading meant we seemed to do well in the Lakes with only one and a half days of showers. Bob's 'bothy' was excellent with about 35 Deesiders sharing the facilities and each others' cooking at a bargain price of about £1.80 per head for a 2 course evening meal. Congrats to Bob on finding such a gem for us. Here is a selection of recipes from the week. Many Deesiders had their own successes against the terrain, courses and their personal rivals but at the top end, Chris Smithard was trying hard but several 'blips' at first controls denied him day wins and probably a good chance of an overall win in M21, eventually finishing 4th close behind those in front, no doubt a best result by a Deesider for many years. Dad, Mike, was more fortunate, finishing 3rd overall, 0.4 of a point ahead of Julian Lailey of SROC in 4th - Mike's score rounding up and Julian's down - too close to matter, should have been called 3rd equal. 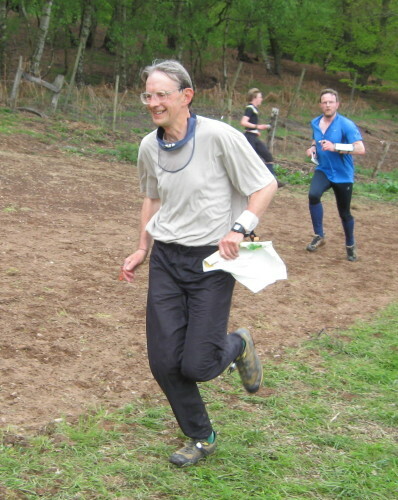 Congratulations also to Norman Hall on his tireless work in organising Caw with many extra tribulations in the final few days - but a great day for competitors on Pete Owens' and Bob Verity's courses including a 15 minute leg on M21 with 4 possible routes all taken by top runners with Chris' route turning out to be the fastest. Chris had shown a very similar leg at his evening's briefing the day before so we had told him which way to go beforehand! Full results for all days here. Norman - the day after the day before - preparing for his run at Helsington. As you can imagine, he found he had nothing in his legs this day. 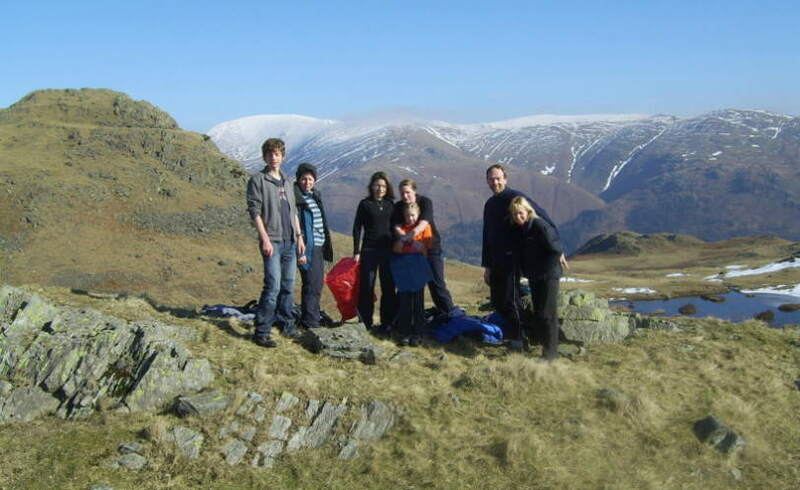 We will be holding a Club Social and Barbeque at Lanehead Outdoor Education Centre, Coniston on the evening of Tuesday 24 August, during the Lakes 5 Day event. This will be open to all, whether you are resident at Lanehead or staying elsewhere in the Lakes. 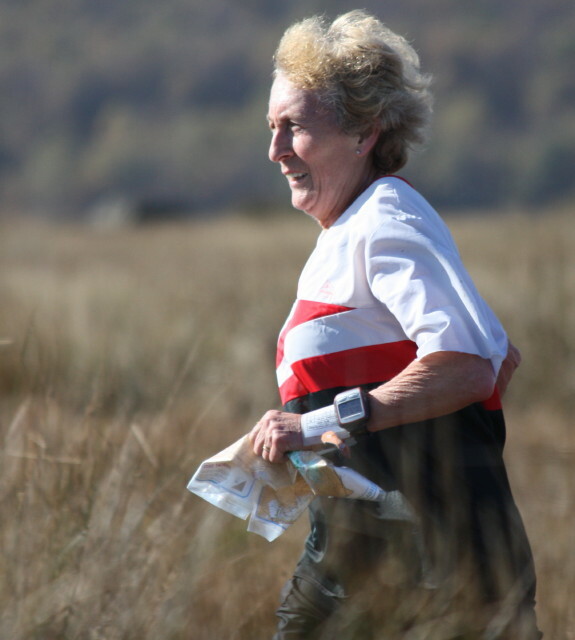 The perfect opportunity to relax after your run at Harrop Tarn, compare your splits with other runners, and build up your strength for the rest day on Wednesday. 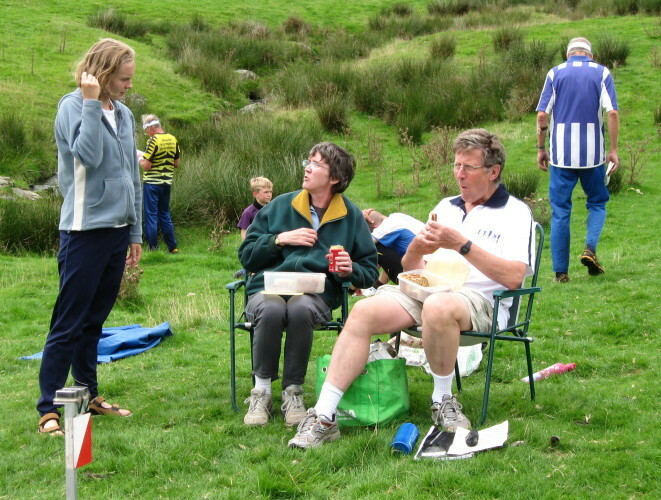 Bring your own meat, fish, whatever you put on a barbeque, and drinks: the Club will provide bread and a simple salad. 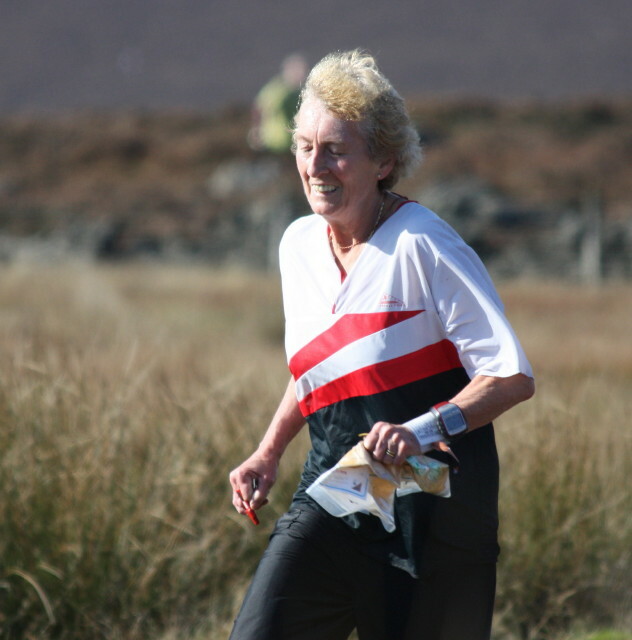 Many Deesiders will be aware that Marian was quite recently diagnosed with a serious illness. Sadly, Marian died on the evening of 1st August 2010. She was at home and had seen all of her family during the weekend. John and their daughter Judith were with her. Marian was a sparkling, lively person with a great sense of humour and for her to be gone so suddenly is a great shock. The Club sends sincere condolences to John and the family. A Service of Thanksgiving for Marian's life was held at Helsby Methodist Church on 19th August; lots of past and present Deeside members were there, as well as family and friends from Marian's many other activities. Due to his moving into a small flat, a friend has asked me to find a good home for his sizable collection of maps. He isn't seeking any payment. British Ordnance Survey 1:50,000 Landranger series. About 185 of a full set of 204 - the missing ones are mainly of the north west. The map covers are fairly worn but the maps themselves are generally in good condition - many have only been used indoors. Most are dated early 1980s, some are more recent. If interested please contact Bob Roach (roach36@talktalk.net) tel 01925 728055. Closing date for entries is Tuesday 31st August. Enter your age class course as per website to be competitive. Short green (Vet) should read M75+, W60+ if it does not. 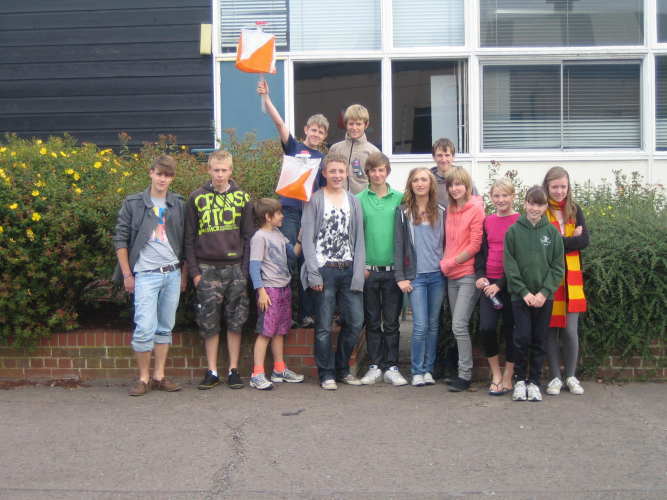 Light Green and Orange courses - scored seperately for boys and girls. Start times: DEE will be allocated start times every so many minutes. If you have a preference, let me know on/before the closing date so I can allocate names to times. 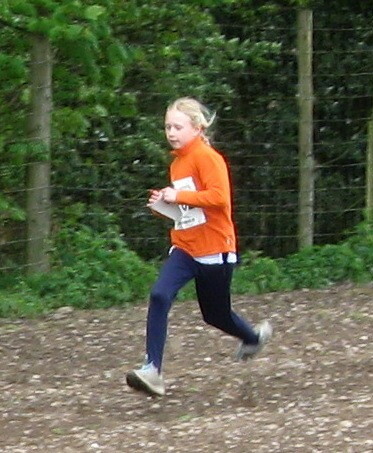 Otherwise, I will tend to put the faster runners off later subject to families starting at similar times. We may decide to move some people onto the Mens and Womens Open courses as we may be short of runners on them. 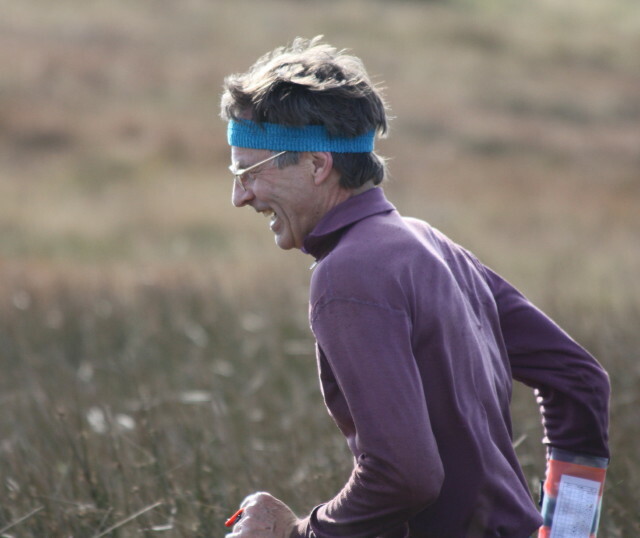 If your class is the Open, it would be helpful to me if you could enter by the Thursday before the Lakes 5 day so I can see how many runners we have on those courses. 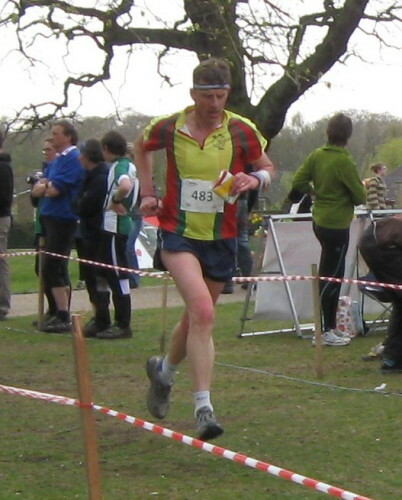 If you are M/W45 - M/W55 or M20 and are willing to run up, please email me before the Lakes 5 day. I will let you know what the situation is at the Lakes or by email before the 31st. If you will be away at that time, let me know that so you can enter in time. Mike Beasant M18 has been selected to represent England at the JHI; Chris Owens M16 is a reserve. For the VHI, both Sara Cambell & Liz Jackson have neen selected for W45; Mike Smithard M60 is a reserve. 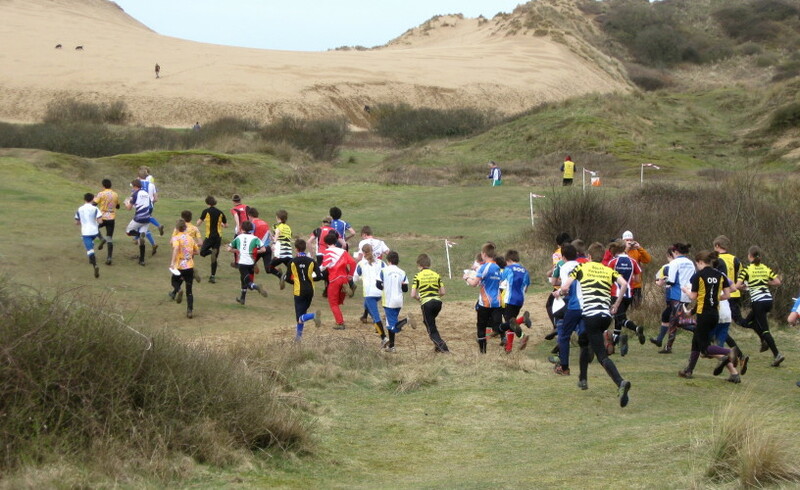 Entries for the races are coming in faster than ever before and most of the 190 places in the A race are already taken. If you're thinking of entering - DO IT NOW!! The B race is well on the way too and I'd expect that to be full before the closing dates on 20 September (postal) and 28 September (online). Follow this link to enter online or to download a paper entry form. 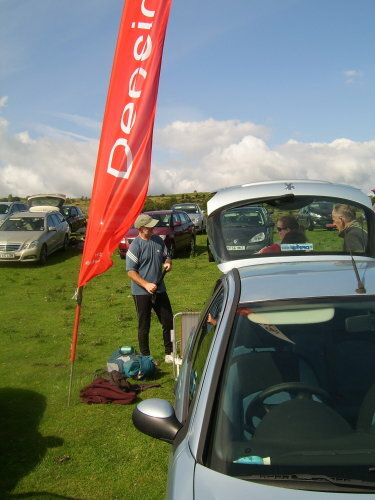 We will again be relying on Deesiders to help with registration, marshalling and other vital jobs on race day. 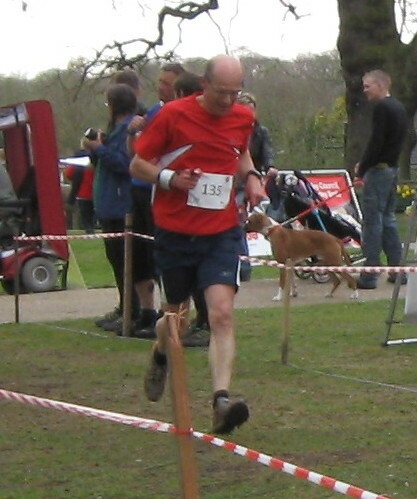 If you're free to help, please email the organiser Geoff Shaw (geoff.shaw@nuvia.co.uk) or phone him on 07919 191995. 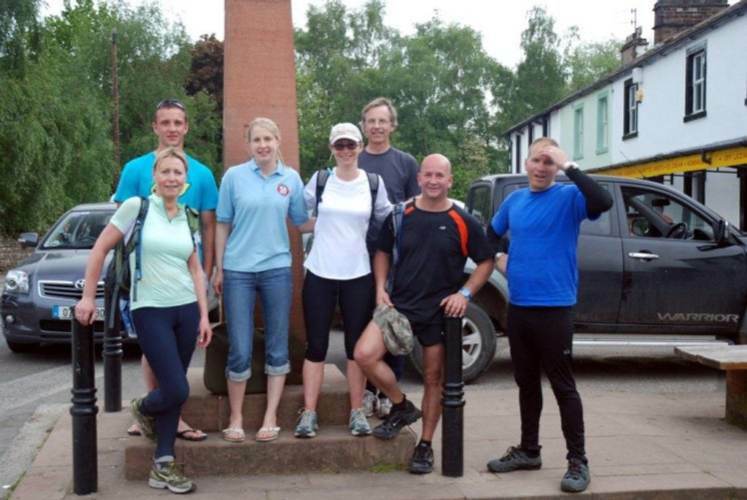 Quite a few Deesiders made it to Macclesfield Forest on Saturday 26 June to compete in the DEE/MDOC Challenge. To score we had to run in the middle distance event in the forest and then later in the day in the UltraSprint event in West Park, Macclesfield. 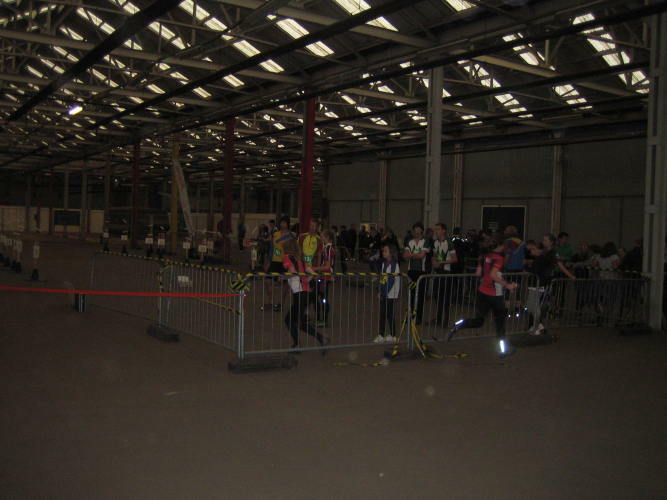 The events were part of MDOC's Regional Town & Country Weekend (rounded off by an urban race in Stockport on the Sunday). Rather fewer of us were able to stay on or return for the park event but those that did had an interesting evening topped off with a barbeque. 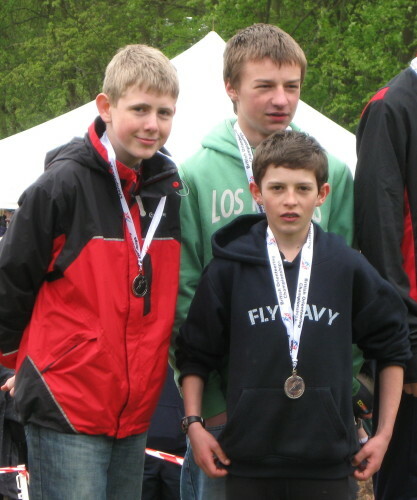 The races were 2 heats and a final, for which you had to sort out your butterfly loops from your gaffles. 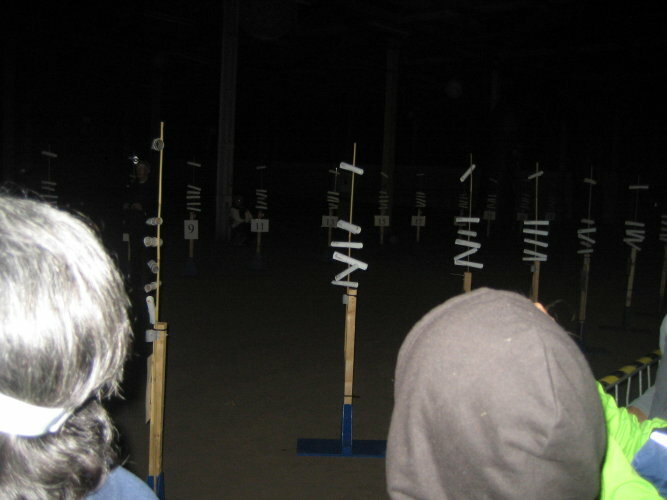 Each race culminated in a tape maze with controls in all the awkward corners. 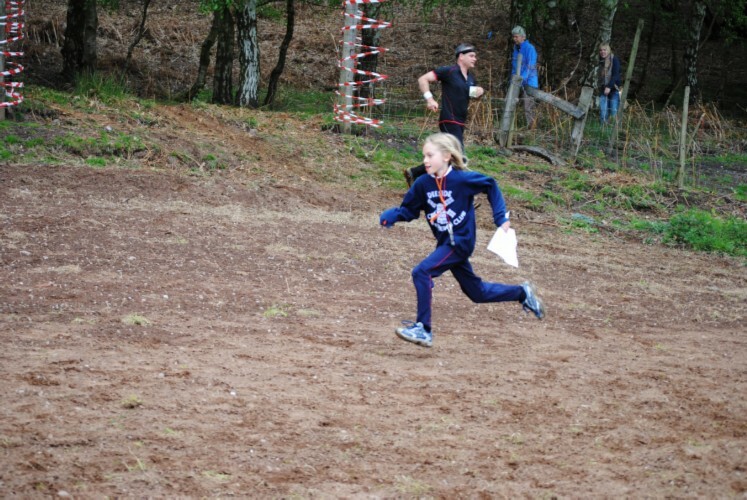 It was a lot of fun, as much to watch as to run. MDOC have shown great originality in event planning recently and are to be congratulated for providing us with such a stimulating Challenge - and for such an amazing range of beachwear displayed by the organisers! 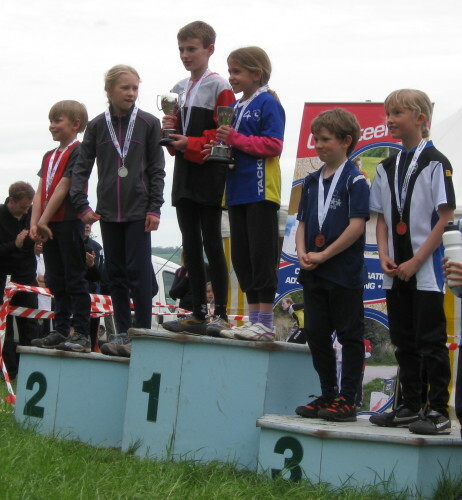 Well done to all the juniors who ran for the North West Squad in the Junior Inter Regional Championships ("JIRC") team last weekend. Everybody ran really well. We have returned the trophy to the North West at last! Also a big thank you to everyone who continues to support the cake stalls - this money will help fund the training tour to Norway - your cake eating is helping our juniors to stay on top!! The copy date for DEE is 5 July. Please send your articles, items and pictures to the new editor Jane Mockford (deeside@yahoo.com) . Cotswold Outdoors have opened in Chester opposite Wilkinsons in Foregate Street - 15% off with BOF membership. 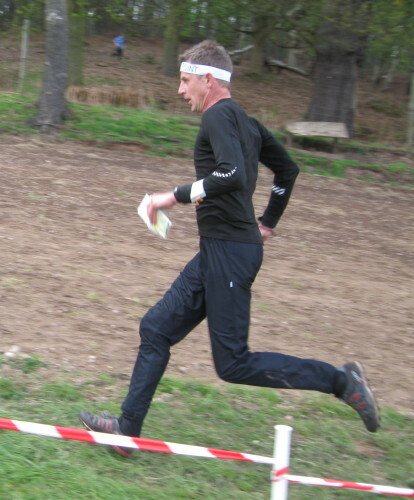 Chris Smithard and Tom Beasant are off to Finland to run in the Jukola relay on 19-20 June. 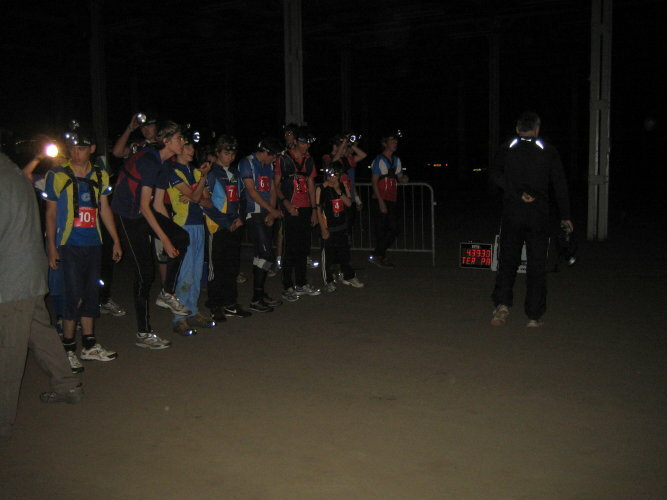 This is an overnight 7-leg relay, with 15 000 participants and 30 000 - 40 000 spectators. 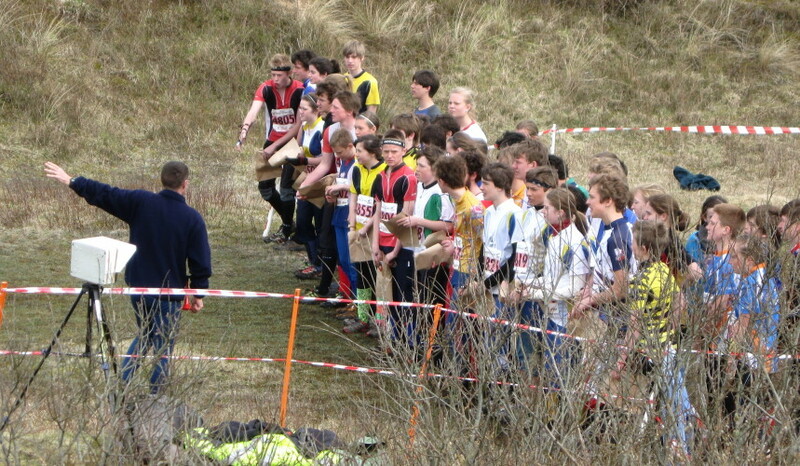 A bit bigger than the Harvester relays then, and more spectators than the average DEE Summer Evening Event. Chris and Tom are running for one of the three "South Yorkshire" teams: Chris on the 3rd - long night - leg for the 2nd team, Tom on either a middle length day leg or a long night leg. We wish Chris and Tom well in their runs. We managed to complete the IRC 12 Hour Challenge, completing the allotted route that my daughter Ali had set from Ambleside to Pooley Bridge via 7 major fells in a total of 11:30 hrs - so her estimation of walking / running speeds was very accurate. Ali set off from Ambleside at 07:30, glad of the early start due to the cooler temperature, although it was already getting warmer by the minute. 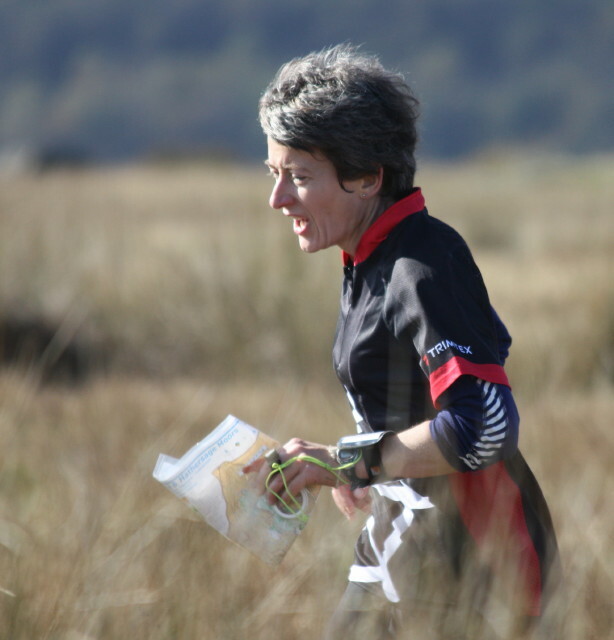 She completed her leg over the top of Loughrigg to High Close Youth Hostel in 0:45, which was bang on schedule. The 1st photo was taken just after she handed over to me and my partner, Gordon, who turned out to be a bit like 'Klaus Braun on steroids' (meant in the nicest possible way!). Our route took us over Silver Howe and Blea Rigg to Stickle Tarn (2nd photo). Right from the start Gordon was having problems with his hydration rucksac. He had taken equipment for any eventuality and even though the sack was a bit like the Tardis in the space available inside, the zip gave up on the pull up Silver Howe and needed some string to keep it together. 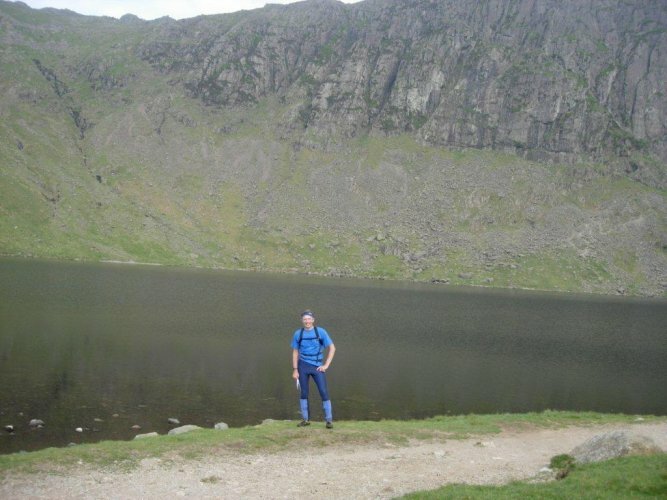 By the time we got to Stickle Tarn, Gordon (shown on the right in the Team Photo) was going well boosted by his unique mixture of water and mashed bananas in his "platypus" (he apologised for having to stop on several occasions because of blockages in his mouthpiece which required some backflushing). The pull up to Harrison Stickle from the Tarn was hard work in the heat but at last there was a cool breeze on the ridge along to High Raise. Here Gordon brought out his secret weapon from his sack - a full length (18") cucumber (he wanted to bring a water melon but it wouldn't fit in!) 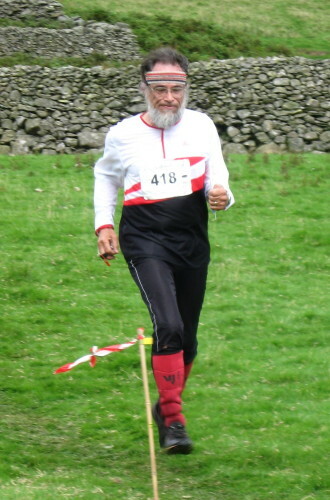 This kept him going well down to Greenup Edge pass and then for the long descent down into Grasmere. This section is not particularly pleasant for running - its rocky and broken up, so nowhere really that you can stride out until you get down to the road. However we managed to finish in about 3 hrs, which was 30 minutes ahead of schedule. 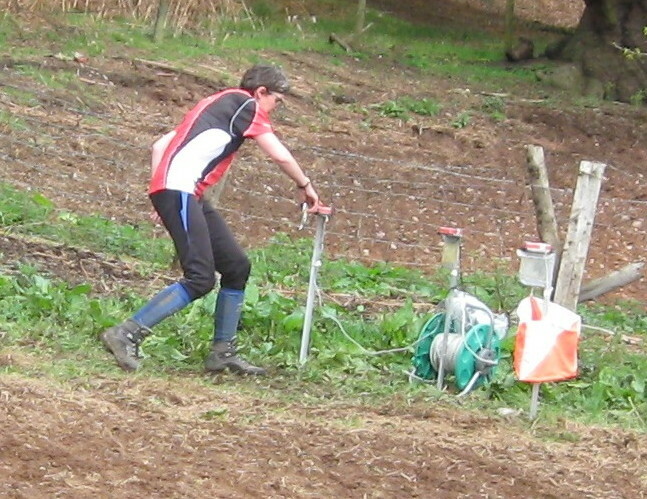 Gordon had fooled his sponsors so they would support him on a per km basis. 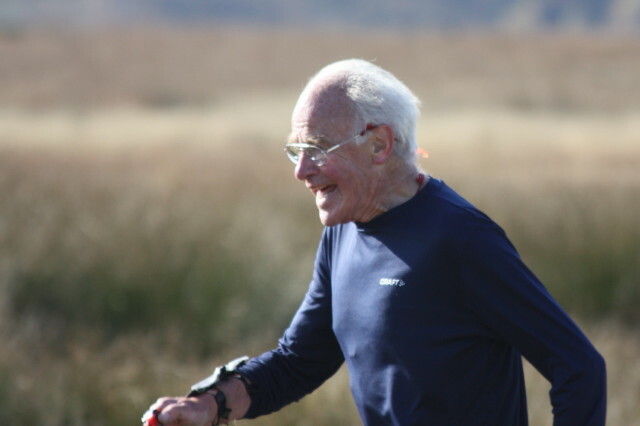 So after the leg he did with me, he continued on Leg 3 over Hellvelyn and then added on Leg 5 over High Street and down to the Finish at Pooley Bridge - a total of 49 km! Ali was also doing the short leg 4 from Glenridding YHA through Patterdale, so I went along to give her some company (as it was all downhill!). I was very pleased during the Challenge that all my body parts stayed in the right places! 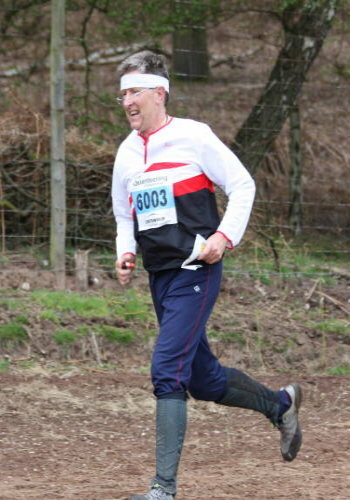 I had been suffering with hamstring and achilles twinges in the week before the run and so was feeling very nervous, not wanting to let the team down. 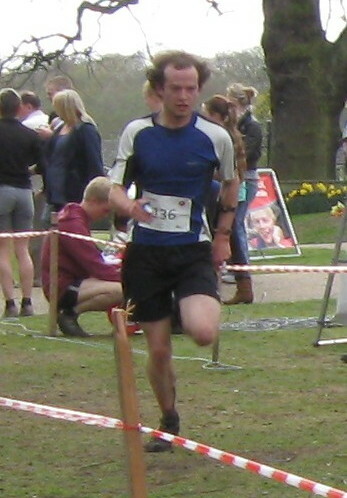 However, there don't seem to be any severe after effects (I might even take up Mountain Marathons again!). Due to members' generosity and that of my work colleagues at INEOS I have managed to raise just over £250 for the International Rescue Corps to help them with their very valuable work. 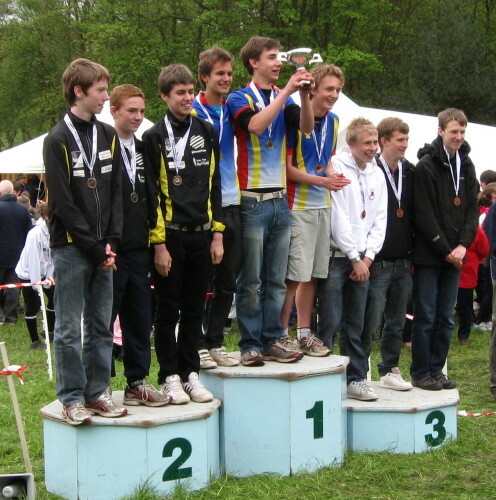 Chris came 2nd in the M16A class at the Scottish Championships in Rannoch Forest on 29 May 2010 - he was the meat in an SYO sandwich, between Zach Field and Simon Bradbury. 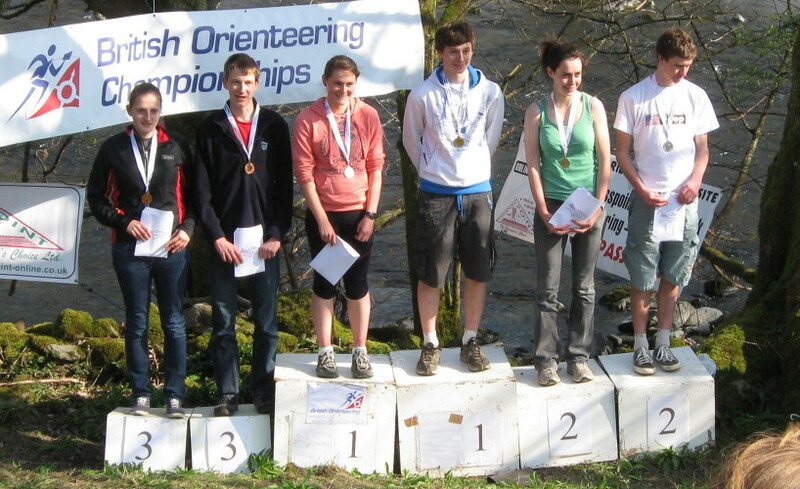 Full results on the Scottish Orienteering website. Good luck to them in their attempt to match or beat their 2nd place last year. The full team is: Katrina Hemingway, Sarah Jones, Katie Wright, Natalie Beadle, Zoe Harding, Rosie Watson, Hannah Bradley, Laura Jones, Charlotte Watson, Katrin Harding, Alice Fellbaum, Sophie Horrocks. Reserves: Carolyn Hindle and Carrie Beadle; Alistair Thornton, Philip Vokes, Adam Barlett, Will Rigg, Chris Nash, Chris Owens, Matthew Penellum, Oliver Williams, Mike Beasant, Lewis Taylor, Jack Wright, Carl Edmonds. Reserves: James Allison and Alex McCann. Many of you will remember former Deeside member Alison Ingleby who is now working for Nottinghamshire CC as an Emergency Planning Officer. In her "spare" time Alison also volunteers as a District Training Officer for the International Rescue Corps (IRC), a UK charity set up to undertake search and rescue missions using specially trained personnel following natural disasters. Although much of their work is undertaken overseas, their most recent call out was following the Cumbrian floods in 2009. 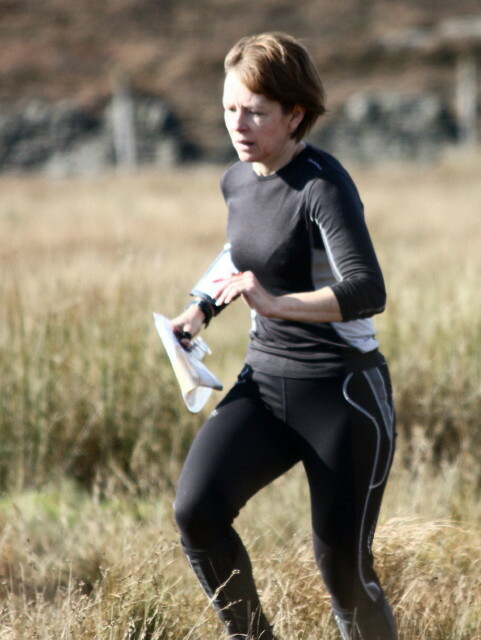 IRC relies upon donations to fund their important rescue work and this has led Alison to organise a sponsored 12 Hour Challenge in the Lake District, in which a relay of walkers/runners will journey from Ambleside to Pooley Bridge via 7 famous summits while a relay of cyclists will undertake a parallel journey visiting 7 lakes en route. 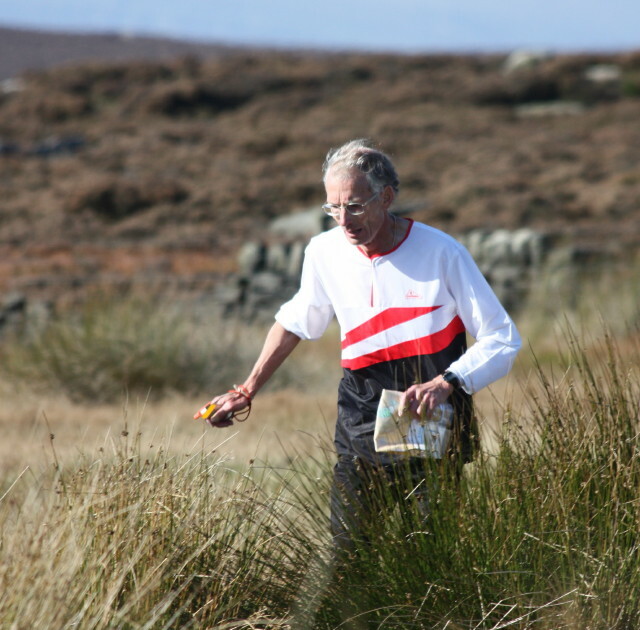 Very few of the IRC are practised fellrunners so completing the allotted journey on foot within the 12 hour limit is going to be quite a challenge. 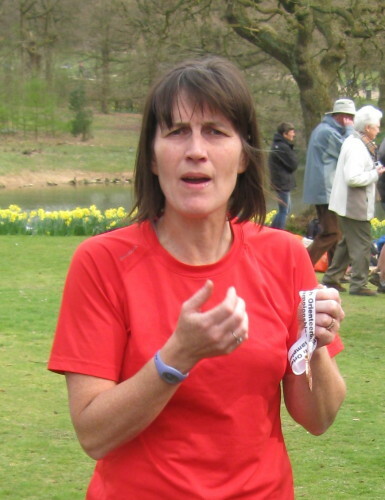 In order to keep at least one of the teams of runners/walkers on the straight and narrow, Alison has asked her Dad (Steve) to navigate on Leg 2 of the relay, starting at High Close Youth Hostel and ending at Grasmere - via Blea Rigg, Stickle Tarn and High Raise. 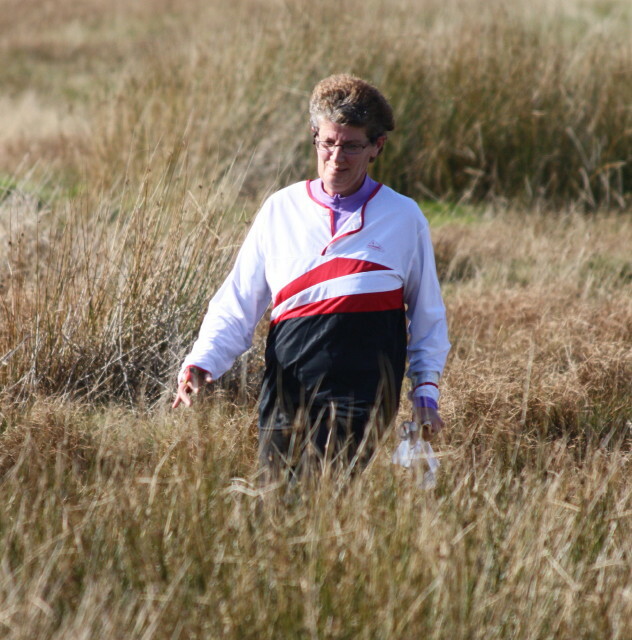 Judging by Steve's recent orienteering performances, navigation may be more of a problem than Alison believes! Steve's leg is about 12 miles, although it might turn out considerably longer if it's misty on the day. If you would like to sponsor this endeavour please could you e-mail him your pledged amount to Steve Ingleby. 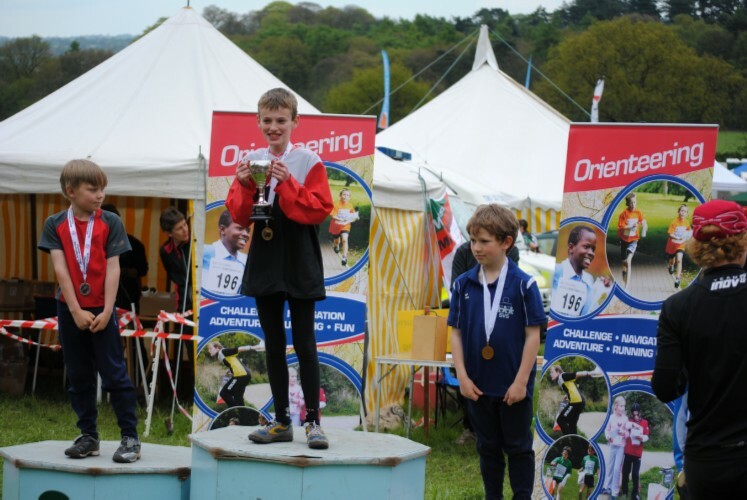 (steve.ingleby@virgin.net) Please can you state whether you would like this sponsorship to be considered under the Gift Aid scheme, which would enable IRC to maximise the income from the event. Thanks to all those Deesiders who have already pledged their suppport for this worthy charity. 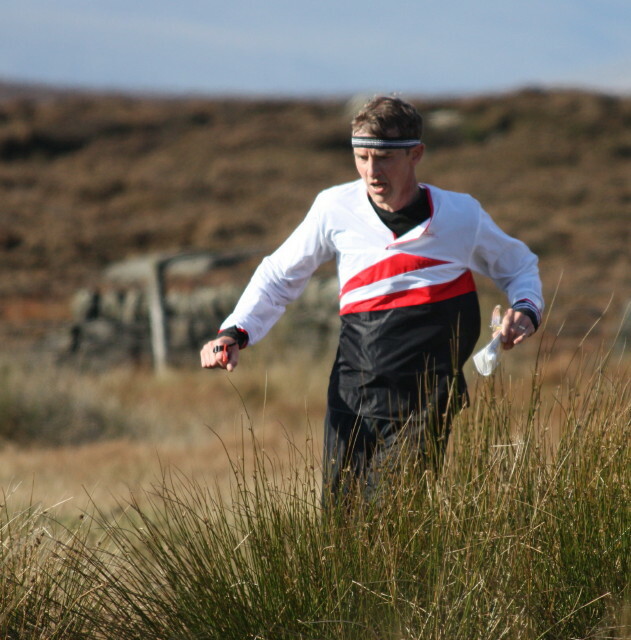 New member Duncan Harris created a stir by winning the Fellsman last Saturday against stiff opposition, covering the 61 miles and 11000 feet of climb in just over 11 hours. You can read all about it in grough magazine. 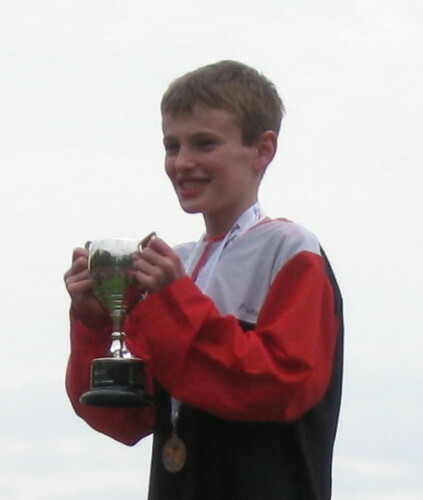 Duncan only managed third place in the Brown on Frodsham Hill in March, but he promises to do better once he's learnt a bit more about navigating. The course will be held on Friday 25th June (full day) and is likely to be on the Marshall's Arm course, based out of Hartford High School (TBC). 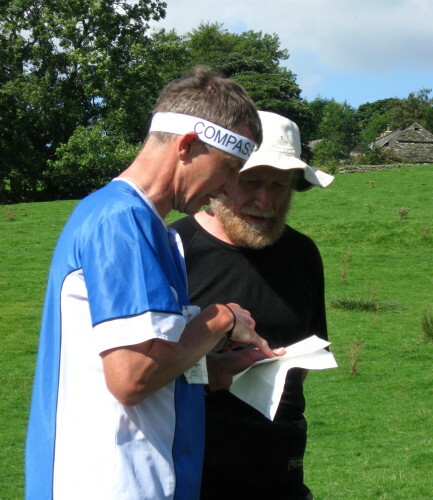 This course is for staff who have undertaken Teaching Orienteering Part 1 OR those who have a good knowledge of Orienteering already. 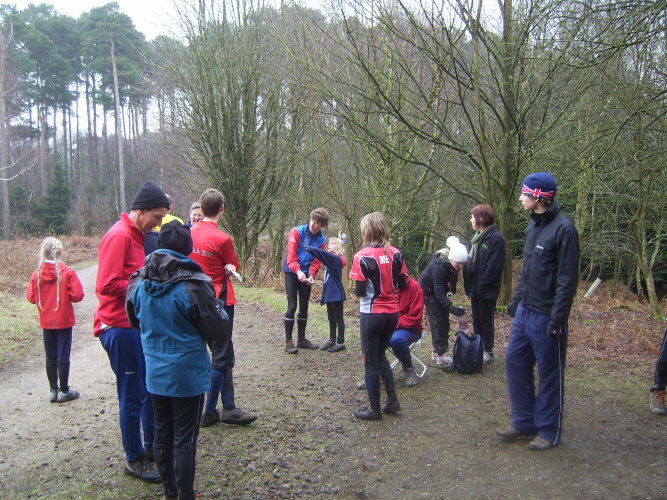 Successful candidates will be qualified to take groups off the school site to parks such as Marbury or Delemere Forest and this course also supports those introducing Orienteering as a GCSE practical option. Further details from Chris Story (chris.story@hartfordhigh.co.uk) and course booking will be through the INSET system for Cheshire West and Chester. DEE members with contacts with Vale Royal schools may wish to encourage appropriate teachers to enrol. 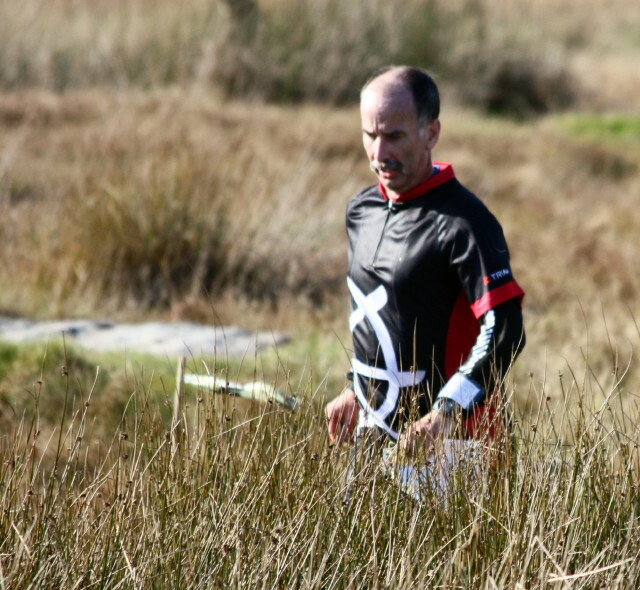 No Deeside teams this year at the Harvester but 2 of our SHUOC members were there: Chris Smithard ran leg 4 in the 7 leg A race, fastest split on that for him and victory for his team and Tom Beasant ran last leg in their 5 man B race team which was also victorious. See the Full Results. Details and entry via the Event Website. MDOC will be providing a complimentary bar-b-que in West Park following the Ultrasprint. This will be free to all DEE members who have competed in both Saturday events. 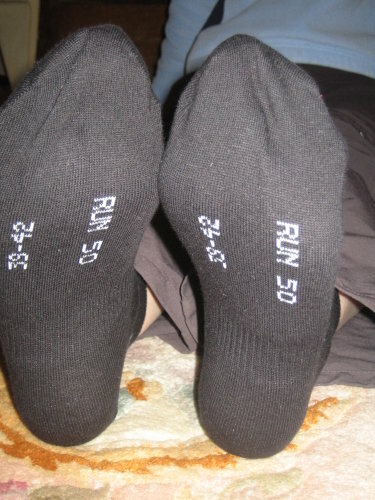 They may charge a nominal sum for non-runners and single event entrants. 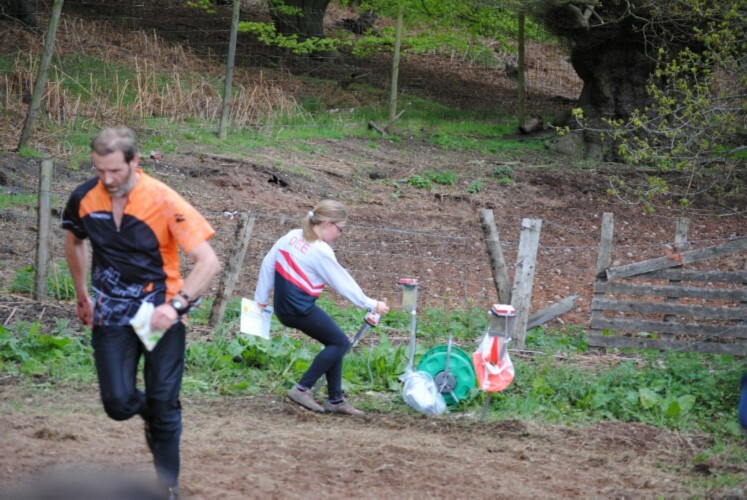 Congratulations to the four Deesiders selected for British Orienteering coaching camps in July: Chris Smithard, Tom & Mike Beasant to attend the Academy Coaching Camp at Uppsala in Sweden; and Chris Owens for the Talent Coaching Camp in the Cairngorms. Deeside is upon us again. The print date is Sunday 23rd May. Thanks for all your contributions for the last edition. Please send me your articles and items ASAP, pictures are especially welcome. I am sure you have lots of interesting stories around the JK and British. All contributions to Nigel Beasant (nigel@beasantn.freeserve.co.uk) please. Full Results for both days now available. No rain on Saturday and no rain on Sunday - but a very chilly breeze blowing. The northern part of the Saturday area is used - straightforward technically with good visibility, larger contour features and shorter legs than Saturday. 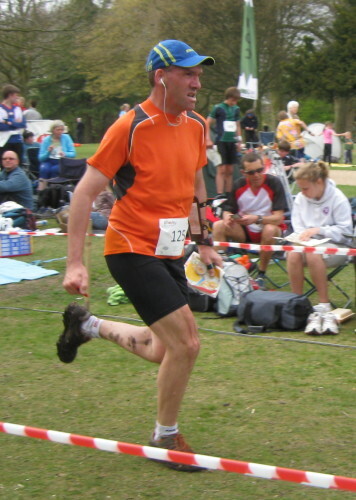 Times are over 1min/km faster than Saturday showing how much straighter you can run. Our top Open team is wiped out when Dave Schorah twists an ankle at an evening event the previous Wednesday - Tom and Chris disappear back into the SHUOC squad where Chris runs last for their 2nd team and whilst lying 4th manages to headbutt a large branch necessitating a sit down to make sure his neck and head are in one piece thus losing the chance to get into 3rd place so eventually 5th. Many people have a reasonably long list of why they didn't quite perform to expectations but Chris's list must be longer than most and is now one longer. 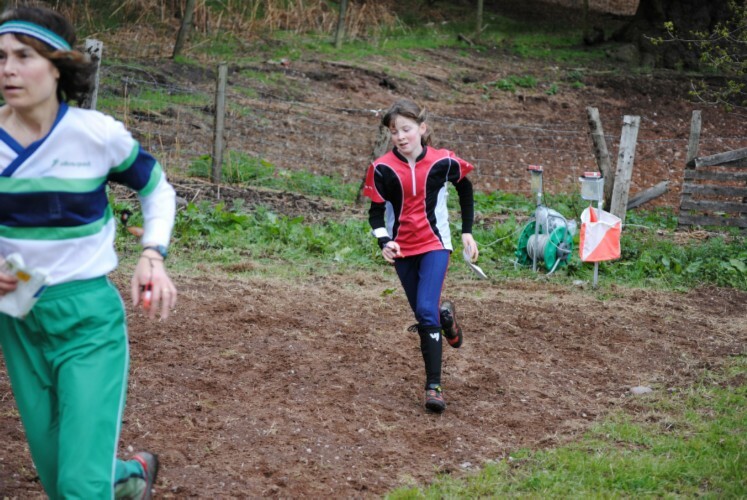 Nina Jones and Evelyn Elmes set off first for the 2 Dee teams in the mini-relay and come back very close together. Hannah and Lachlan make steady progress through the closely spaced field to finish 7th for the first team - not bad against the M/W12's. Ed does his now expected excellent job on the first leg of the M14 relay, back in 2nd on the leader's shoulder (not literally). 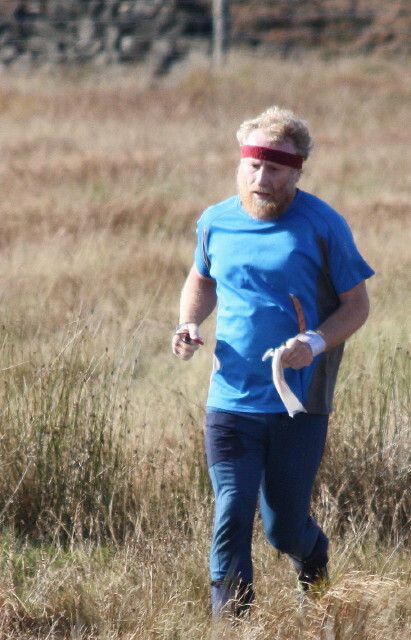 As normal, 2nd leg takes longer but William comes back just in the lead setting Philip off. 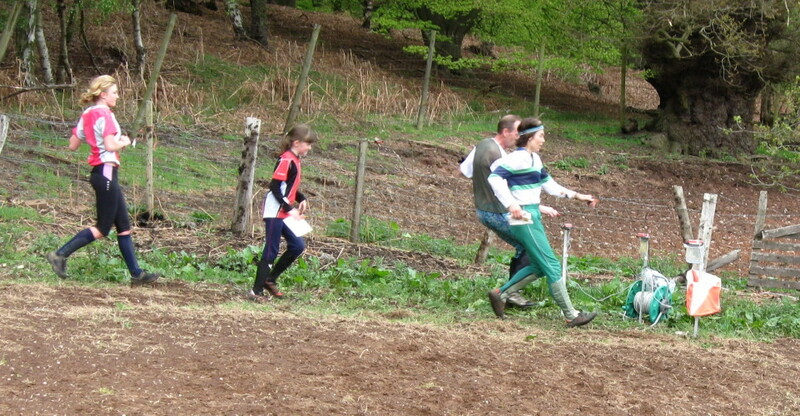 Drama as the OD runner comes into the field just in front, slips over at the last control but still manages to hold off Philip as they race for the line - 1 metre apart. Tears I'm sure but smiles by the time they go up on the podium - 2nd is 2nd but a minute or two longer and it would have been 4th, 5th... so silver is great. Congratulations to them. Our M18 team performs in a fairly similar fashion - close behind on 1st leg (Chris Owens), up into 2nd (Matthew Vokes) 30 seconds down after 2 but that man (lad) Aidan Smith comes past on 3rd leg to push Mike Beasant down to 3rd. Still, strong competition in this class so no easy medals this year. 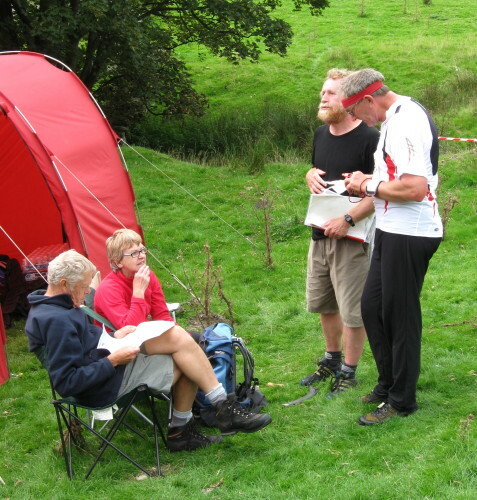 Our non-comp 'W18' team of Zoe Smithard, Liz Hughes and Jon Hughes (running as a LOC team who were unable to attend as they had been stuck in New Zealand for weeks after the volcano and really needed to get some work done!) unsuccessfully challenged the real W18's so no stars to them. A few stars to our DEEclining team of ageing and over-age M50's who very nearly caused an upset against their youthful opponents with Mal coming back in 7th and Steve and Mike holding that position not many minutes down on 3rd in a large field. Interesting scene when Bob Elmes is encouraged down the run-in by team mates Norman and Alan (ageing delinquents of DEE) - the photo appears to have been censored - or did Jane fall backwards in shock/laughter so missed the shot? 'This is not a car boot sale' said the sign at the end of the long entrance track - 'cos once you're in, you're in as they say. Setting off from home after the first starters were off at 10am, two hours later we arrived with still nearly two hours before we start - last. Bob 'Middle start please' Elmes (ST 10:23) has set up DEE camp in a good location which keeps the wind off. Someone is smiling already when we arrive - Daniel Weaver is leading M10 - first of 8 finishers and only 10 entries - so a podium place already guaranteed! 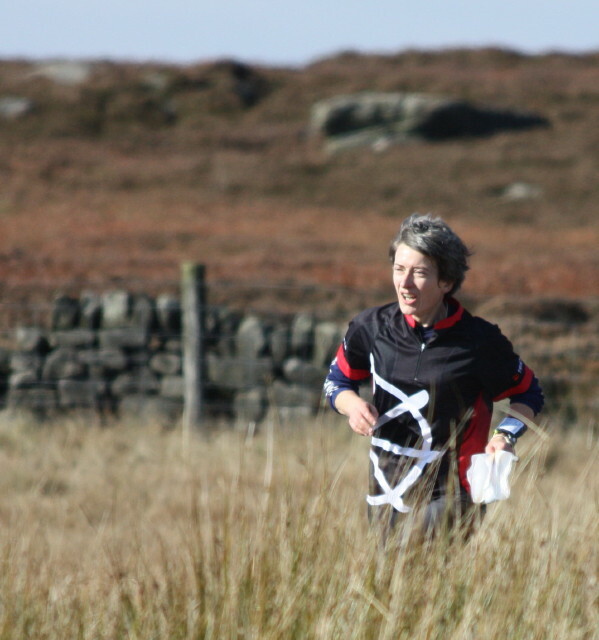 Surprise results abound - Liz Jackson has 'messy' run, doesn't focus as she did for her 2nd place in the middle distance champs but ends up 2nd again - Andy Hemsted has his normal run but leads M60 by 10 minutes when I go off for my start - but with plenty of good people off late. 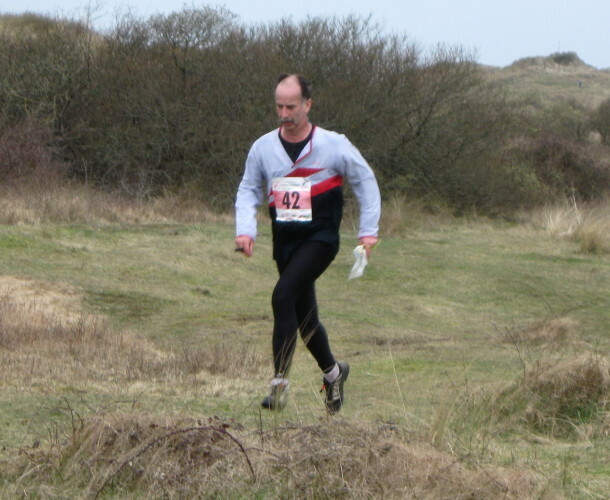 But, apart from myself, that 10 minutes remains to 3rd place at the end - it's bizarre that so many good runners lose so much time - the longer courses are a mix of short detailed legs at the start then long route choice legs - a mix testing several skills/running speed. 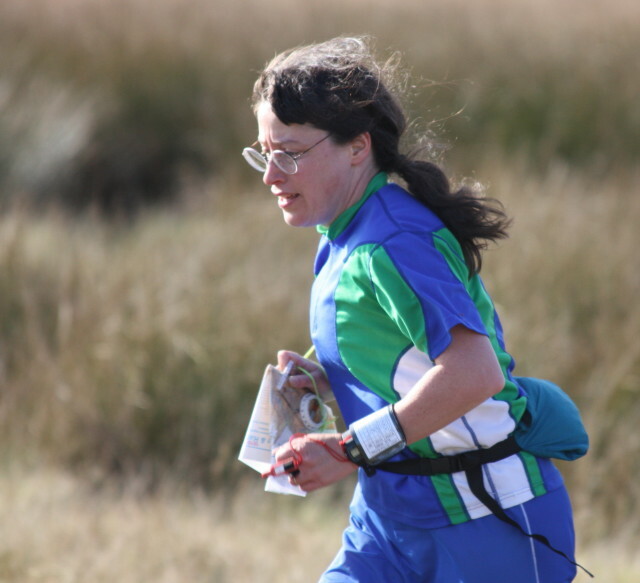 Emily Davies has bad luck in that she gets a misplaced map from her box but luckily realises and returns to the start to get the right one - but has lost lots of time, Rick Hughes hears mixed message about some courses having descriptions on map and some not so doesn't take any loose ones. Did well, only getting 2 wrong out of 17(?). 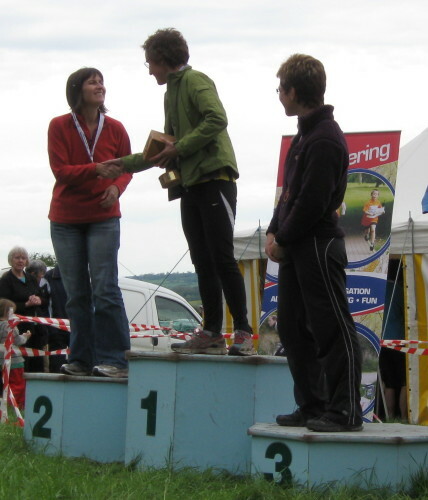 So, when the dust settled, how did DEE do podium-wise? 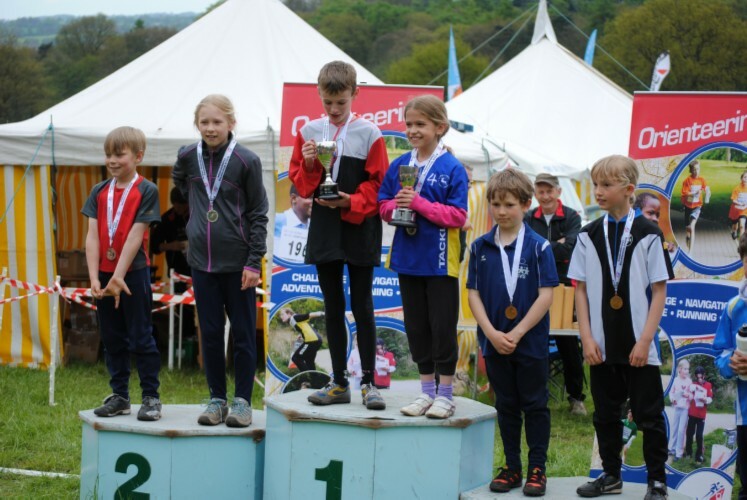 Above average I would guess - we covered the age range as at the JK only better - Congratulations to our two British Champions - Daniel Weaver in M10 and a resurgent (?) 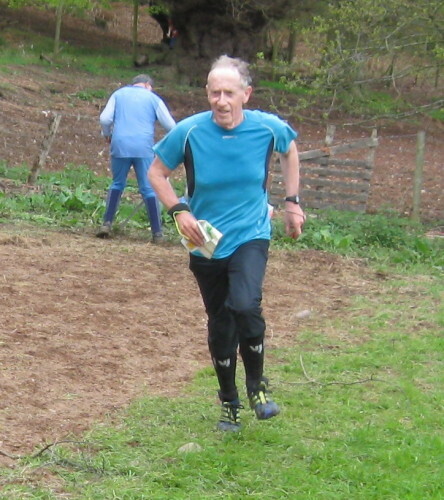 Terry Harper in M70 and to our other top performers - Hannah Hateley 2nd in W10, Mike Beasant 2nd= in M18E (what a year he is having in his 1st year), Liz Jackson, 2nd in W45, Mike Smithard 2nd M60. 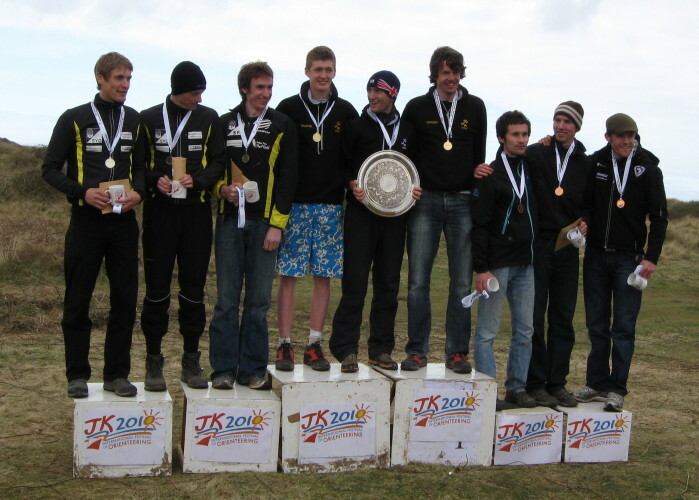 Other top placings included: Philip Vokes 9th in M14, Olly Williams a great 5th in his first year M16, Matthew Vokes 11th in M18E, Chris Smithard 11th in M21E (3 mins off 4th - 16.4k in 97mins), Malcolm Irvine 11th in M55, Zoe Smithard 1st W20L, Sara Campbell 4th in W45 and Barbara Majumdar 7th in W60. 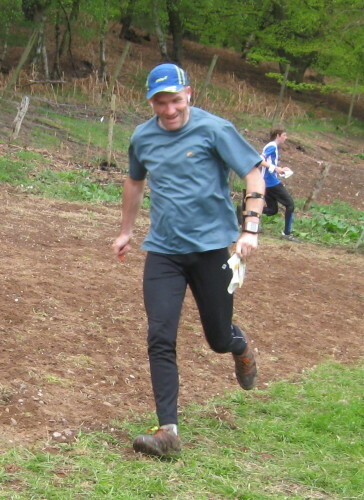 Lots of others very happy with their runs - others a bit miffed about gorse covered 'open' areas in the detailed bit. So, 2 M10 champions in a row for Deeside - what a great achievement! What's the IOF symbol for a control in the middle of an impassable rock face? "Being lost is a given of human existence." Michael Chabon: Manhood for Amateurs. 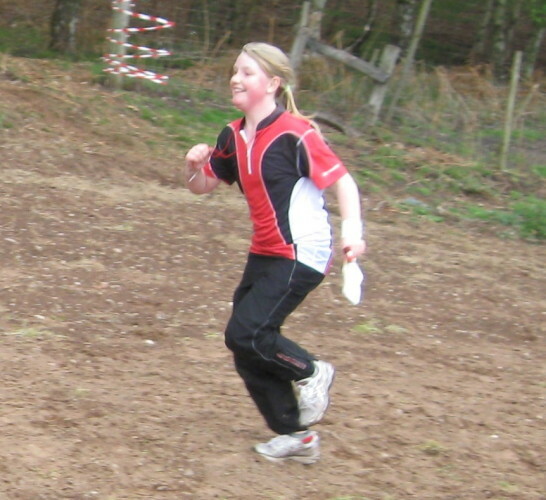 Sprint races - do they excite you? - some are, well, 'boring', easy..... Anything a bit different makes it worthwhile going once to a venue at least. Chorley was like this, a mixture of built up area, parkland and woodland, enough to generate comments and interest. 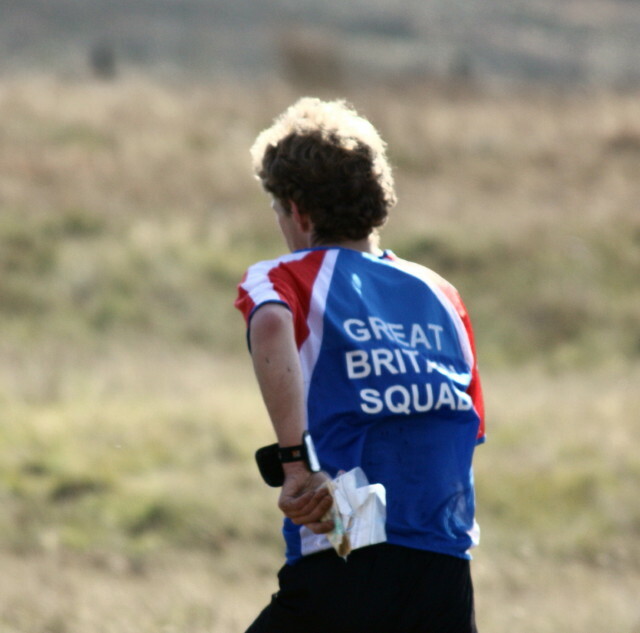 As it's the Elite Champs, so only mens and womens races with a separate non-championship race for M/W16- runners. Morning heats sort out which final you run in in the afternoon - except the junior heat (only 1) which determines the reverse starting order in the afternoon. Off into a detailed housing estate with pathways and cul-de-sacs but no real barriers or difficult routes so it's a question of keeping track of where you are. Across a road and into a brambly, boggy wood, out into the park for a spectator control across the lake then a quick dive back into the woods and finish. It's desperate if you want to get into the men's A final - only 5 from each heat get through, it's seeded but a slight slip and you're out. Heat 4 is lucky for SHUOC as they fill 4 of the 5 places including Dave Schorah and Chris Smithard. The junior heat is closer - Olly Williams ties in first place with Chris Owens 1 second behind and several others within 10 seconds. This means that Olly is off 1 minute behind Chris in the final with the other first placed runner a minute behind Olly. The men's final is run first so everyone can watch the tension build. They start in the town centre and that section is straight forward compared to the morning, then into the park/woodland, coming through a spectator control with 4 to go. 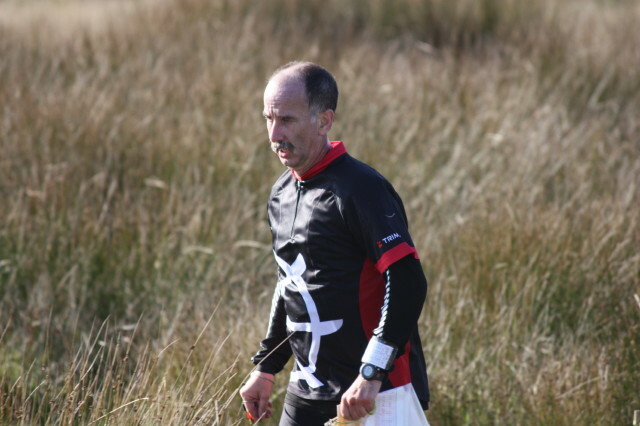 Chris S is off 5th and has caught 3 of the previous runners by the spectator control, coming in a minute clear at that stage. 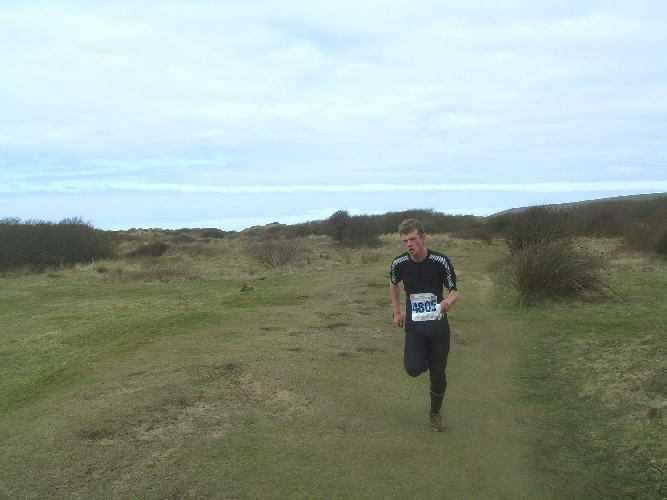 Dave comes through strongly to finish just behind Chris with the eventual outturn of Chris 8th at the front of a pack of 4 within 11 seconds of him with Dave 10th. Well done to them. 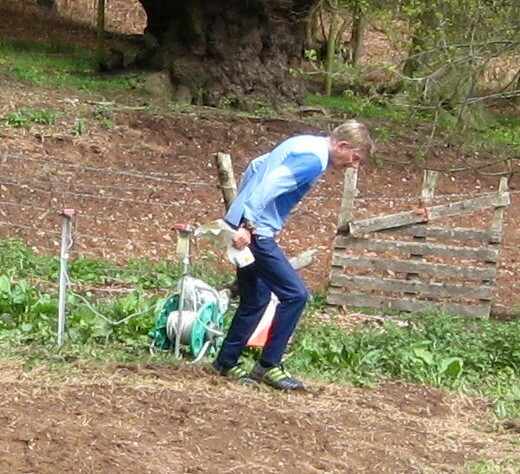 The junior final turned out to be dramatic - with a few runners to come, Aidan Smith was leading, then Chris Owens is seen coming up the hill towards the spectator control, in a fast but not leading time. 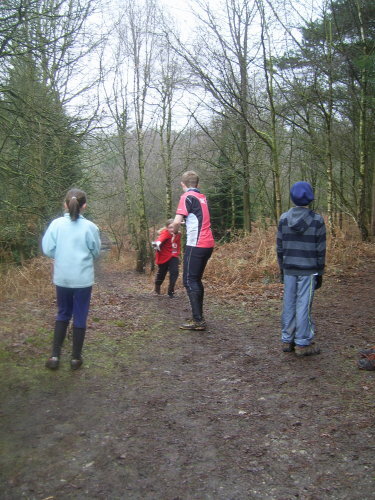 Suddenly Olly appears behind him, in the lead, and they run through the two visible controls and off down into the wood for two controls before coming back up the hill to the last control. We think Olly has a comfortable margin over Aidan but it turns out to be just 18 seconds as they turn downhill. 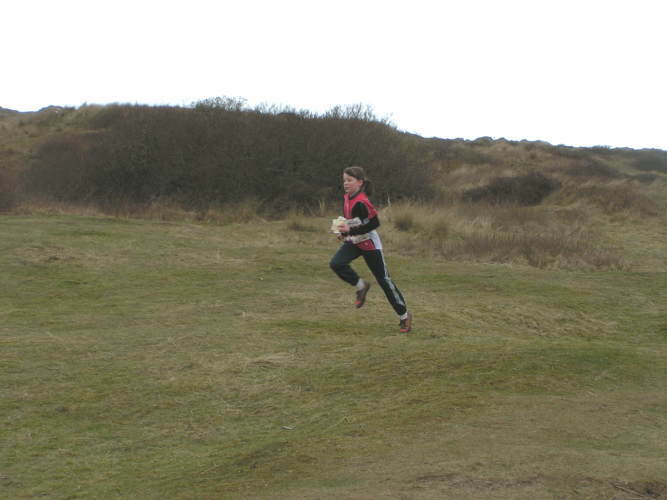 Then Olly re-appears running strongly uphill and finishes to lead. The last starter comes through but not in the lead. 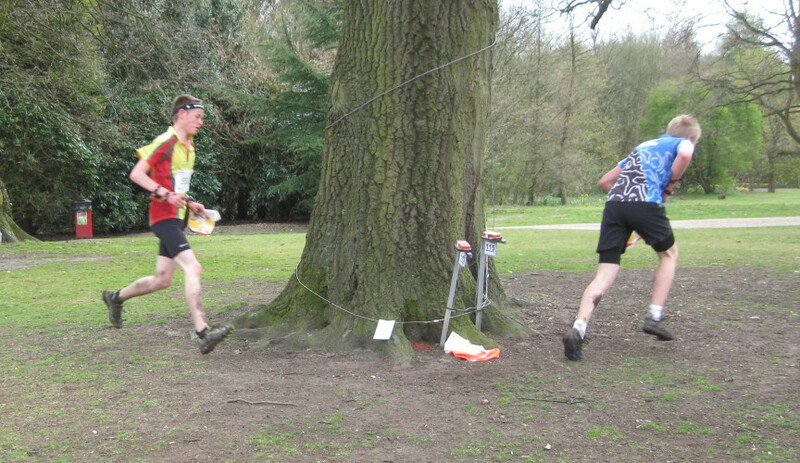 The splits reveal that Olly loses 18 seconds in the wood so is tieing with Aidan at the 2nd last control but gains 1 second on the uphill leg and then they tie on the run-in - Olly wins by 1 second! So a tie and a 1 second win in one day - could be a record. 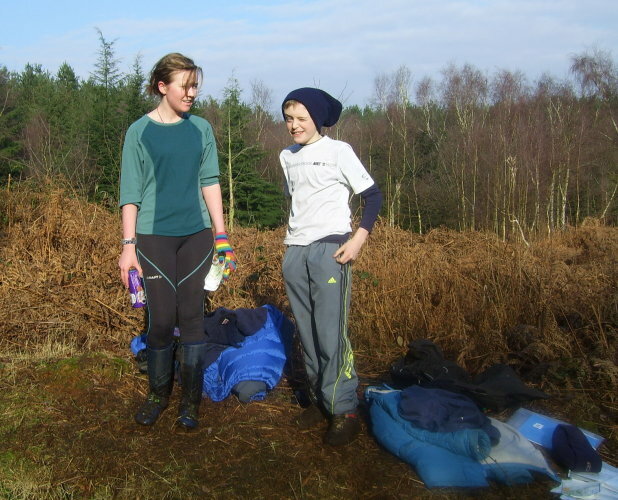 Well done to Olly - enjoy your Go-Ape prize! 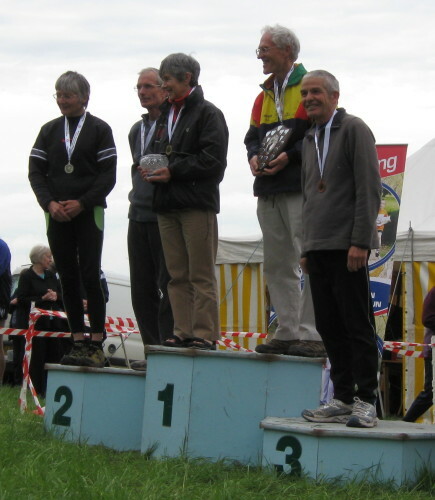 Deesiders extracted 4 bronze medals at the British Middle Distance Elite and Age Class Championships at Haverthwaite today. Accuracy and attention to detail were needed on the detailed, but not too detailed [That's a matter of opinion - Ed], terrain. 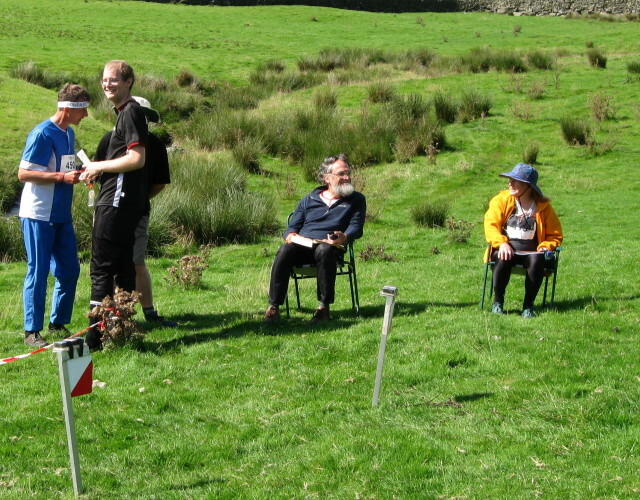 Runnability was better than anticipated and most courses were kept on the higher ground avoiding the steeper eastern slope with its myriad re-entrants and crags. Depending on rock features was always dubious as there is always uncertainty on what is mapped. Congratulations to those who succeeded in keeping in touch whether prize winners or not. We are sorry to announce we have to cancel the Pettypool Summer Evening Event that was scheduled for Thursday 6 May 2010. 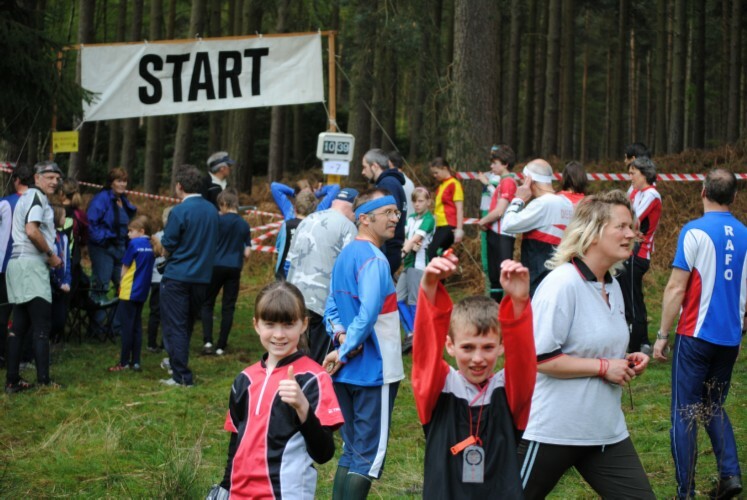 The Forestry Commission have withdrawn permission for the event because of planned work in the area. After years of being overshadowed by our juniors, Deeside seniors are fighting back. 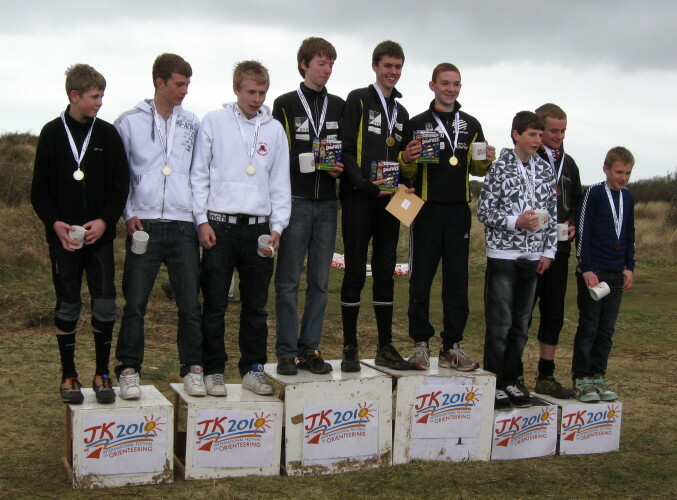 When was the last time 2 Deesiders finished 1st and 2nd in a JK individual race? 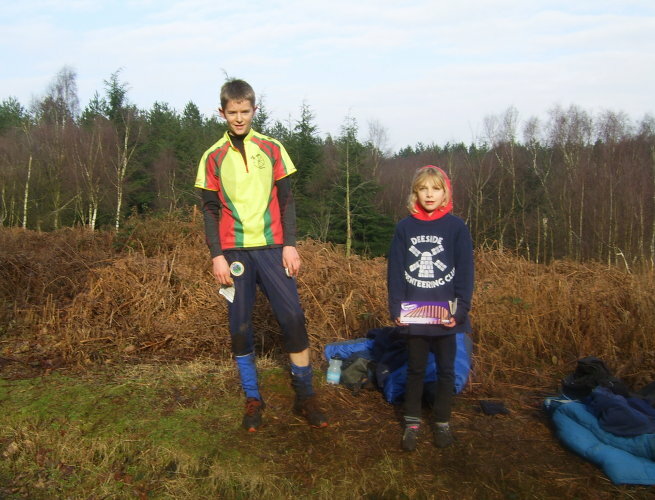 Sara Campbell and Liz Jackson achieved this on the first day in W45 in the glorious mud of Cookworthy Forest. Liz lost a little in the sand dunes on the 2nd day but Sara did well again finishing 2nd on the day to win overall. Well done. Nice pair of shoes. But that's not all. 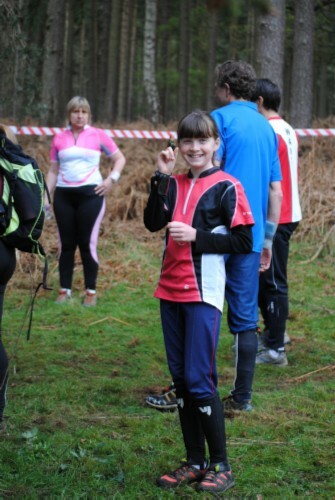 She also won the 'sprint' race on day 1, so two nice pairs of shoes! 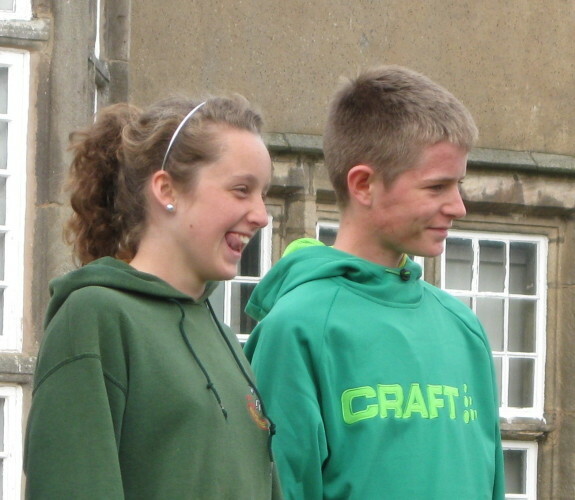 Our other successful competitors ranged from Hannah Hateley, 2nd in W10 to Terry Harper, 3rd in M70. 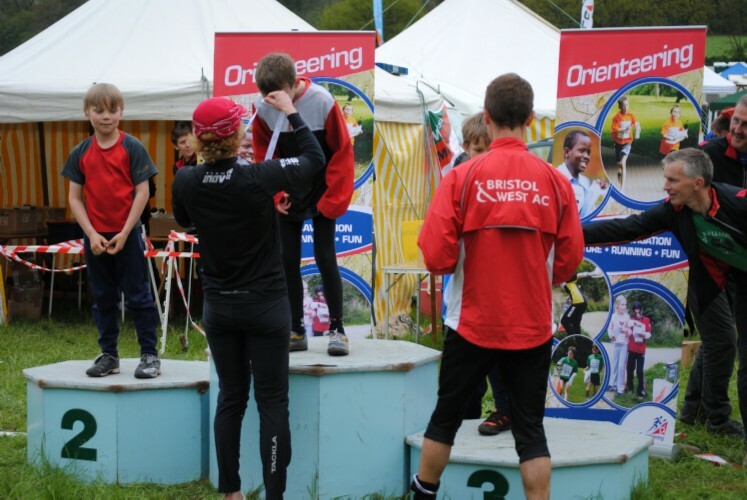 In between were Mike Beasant, 3rd in M18E (a great result in his first year in M18), Mike Smithard, 3rd in M60, Chris Owens, 8th in M16 and David Schorah, 12th in M21E. 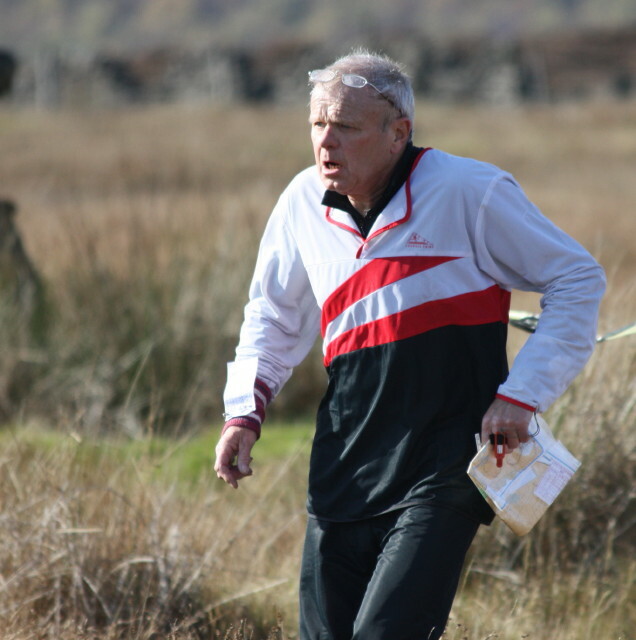 Dave's runs got him into the SHUOC first relay team with Ralph Street and Graham Gristwood when Dave took them into the lead after the second leg for Graham to come home 1st in the JK Trophy relay. Congratulations to him. 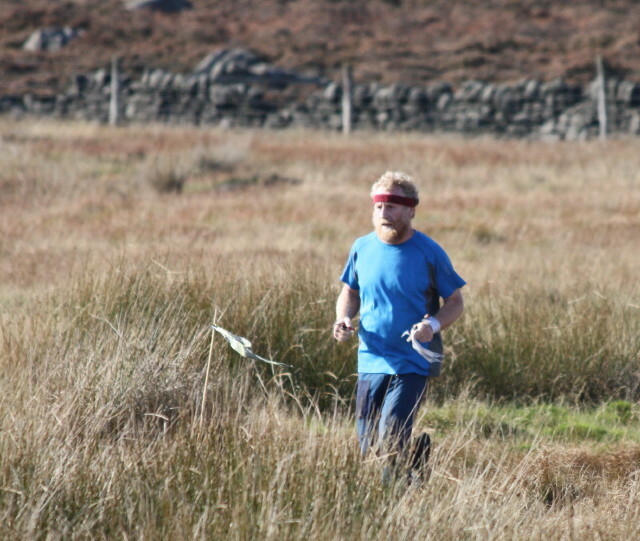 Deeside's success in the relays was by our M48- first team when Chris Owens came back with the leading group, Philip Vokes lost a little ground on the 2nd, with Mike Beasant getting away from the chasing group to come in 2nd after the SYO team. 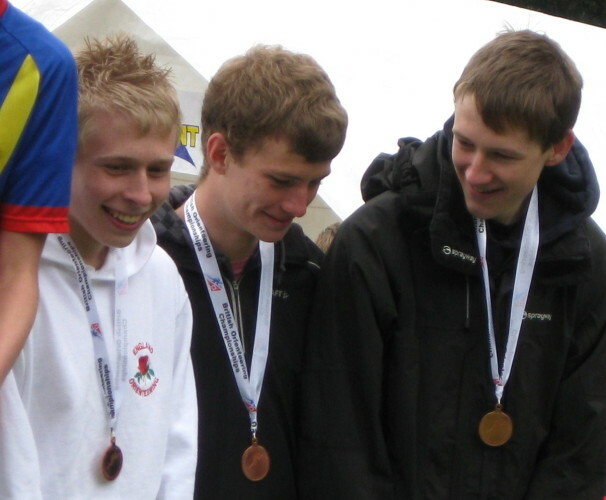 Our 2nd team in that relay finished a creditable 7th place - Olly Williams, Ed Calow and Matthew Vokes. 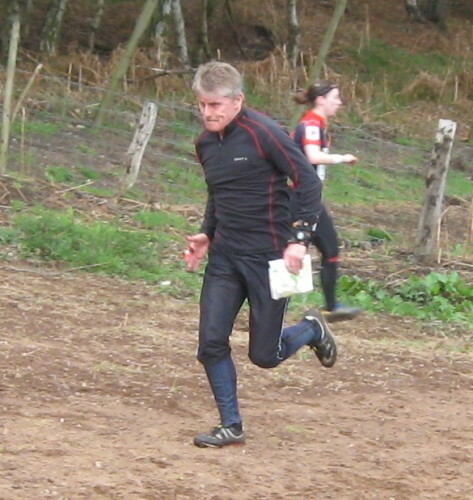 Top placings in the sprint race were: Dave Schorah 8th and Chris Smithard 11th (12 seconds behind Dave) in M21E, Sara Campbell 1st, Mike Smithard 2nd, Chris Owens and Matthew Vokes 6th and Pauline Smithard a very good 9th/54 in W55. 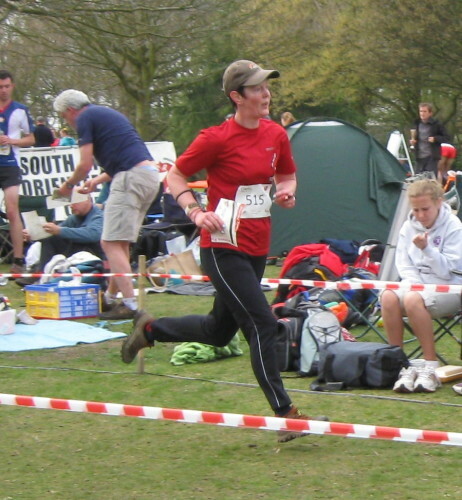 See the SPORTident UK website for all the results. 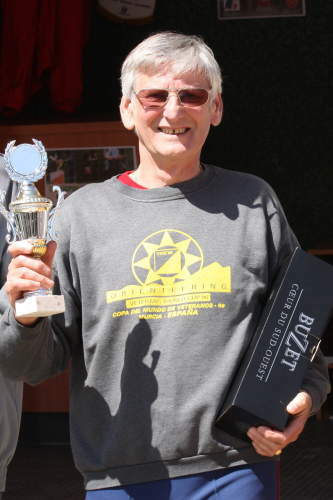 John Evans won H70, leading off in the chasing start 4 seconds ahead of 2nd place and extending his lead to a winning margin of 10 seconds in the run in. 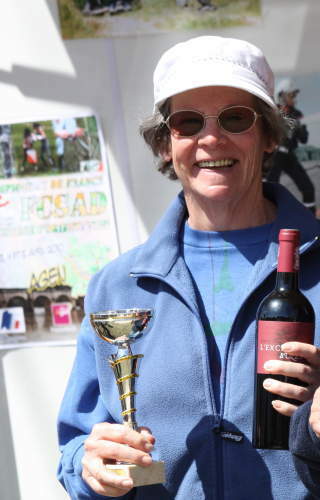 Not to be outdone Carol Evans, on the same course, took 3rd place in D65. 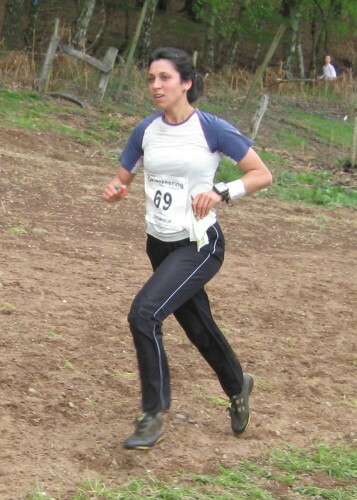 Jane Campbell running for French club GO78 was 2nd overall in D50. Lots of stuff about the event, plus full results, at the event website. Both these events also count towards the North West Regional League. Note that the sprints are open to all age classes. These events say "Elite" in their titles: that doesn't mean that you need to be an Elite in order to enter. There is plenty of opportunity for less-than-Elites to enter and to compete. 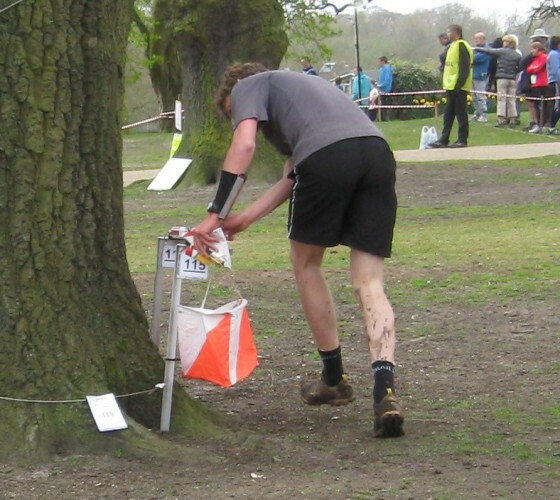 Those of us who went to the 2009 events held in the East Midlands had an exceptionally good weekend's Orienteering, and this looks like being another one. Pre-entries have now closed. 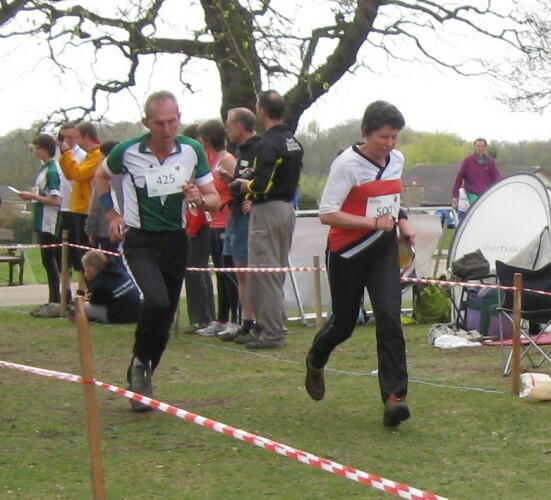 Your editor's understanding is that EOD may be available for the Middle Distance event on the Saturday, possibly requiring you to request it in advance, plus EOD for colour coded courses; but that the only EOD on Sunday is for a Come-And-Try-It course. Please check the event websites and final details if you intend entering on the day. Printable details of the whole weekend in the Weekend Flyer. Bob Elmes got his money's worth on the Short Green. We may have been about 16 fewer than normal, but I didn't get that impression. We filled one dining room for meals and filled the other for Phil Hay's birthday party games so no feeling of sparseness. What a weekend for weather!! Better I think than the CSC weekend in January, our normal date. Ice on the passes meant very few made it to the WCOC event on Sunday but we enjoyed in various places the blue sky and snow views instead. Calows on Coniston Old Man, Beasants - Angle Tarn and Langdales, Smithards and Hateleys, Silver Howe etc. Our return to the YH co-incided with the warden's dog's exploration of the angled roof of the hostel! The cook tried, with success, to prevent it exiting in a downward direction and got him to escape left (as you look at the picture) to a flat roof. My memories of my last visit here (in the 80's?) 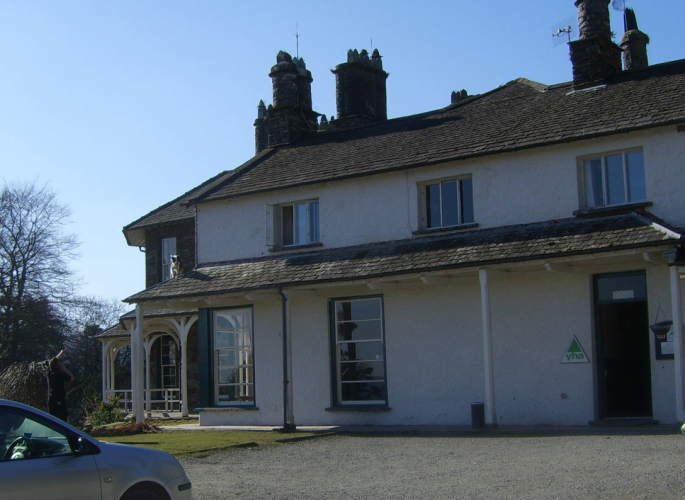 has maybe delayed our visit here, it's only a 2 star hostel apparently because of it's sub-standard provision of toilets/showers although it's the same price as the 3 star Arnside hostel so well liked last year. It's a great location, what were other's thoughts re the hostel? My memories? having arrived in the dark, walking out in the sunshine at 7.45 on Sat morning, 100 metres towards Elterwater over the cattle grid - what a view! Stunning is the only word. 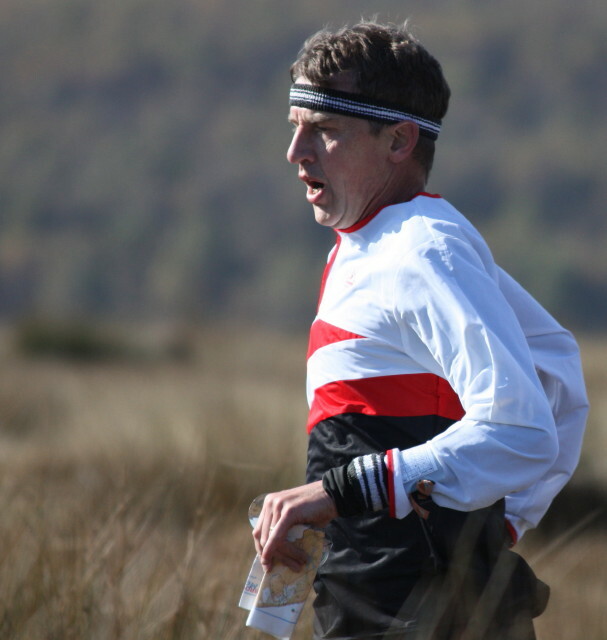 Manning the finish on Sat pm on Loughrigg terrace with the views over Grasmere to Seat Sandal and the Fairfield range and watching many Deesiders running up Loughrigg Terace towards the finish. Well done to those. PS - the cook got a reprimand about the 'custard' which provided a fair amount of comic comment on Saturday evening. The gluten free afficionados had very nice cream instead thank you. Editor's note: Many thanks to Mike for organising the hostel and the training, and to Pauline for dreaming up the games. A great time was had by all. Editor's other note: Well my last stay at High Close was in 1964, when I was younger and slimmer than Chris Smithard is now. 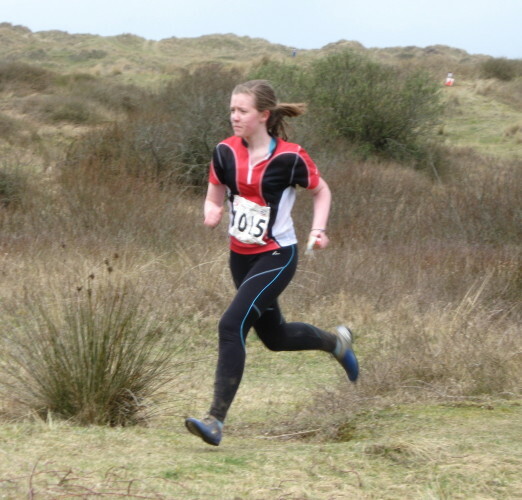 Nina Jones is W12 Welsh Champion! 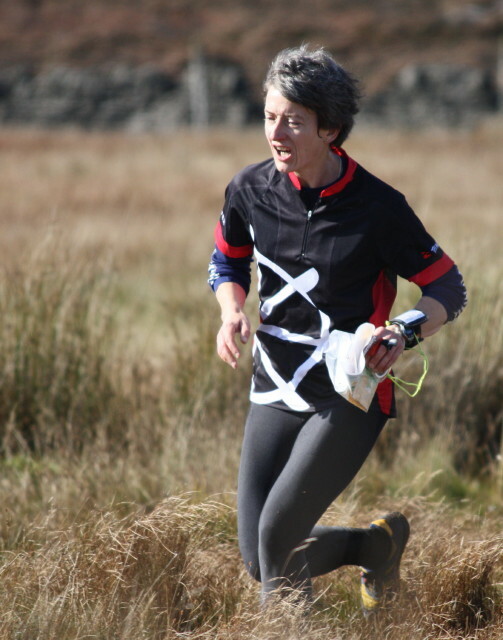 Congratulations to Nina Jones , who recovered strongly from a tricky first few controls to blast round the Orange course and become W12 Welsh Long Distance Champion in the tough but beautiful surroundings of Bwlch Nant yr Arian, near Aberystwyth, on Sunday. Full results here - then scroll down to find the links. The sad News has been received that Phil died suddenly recently. 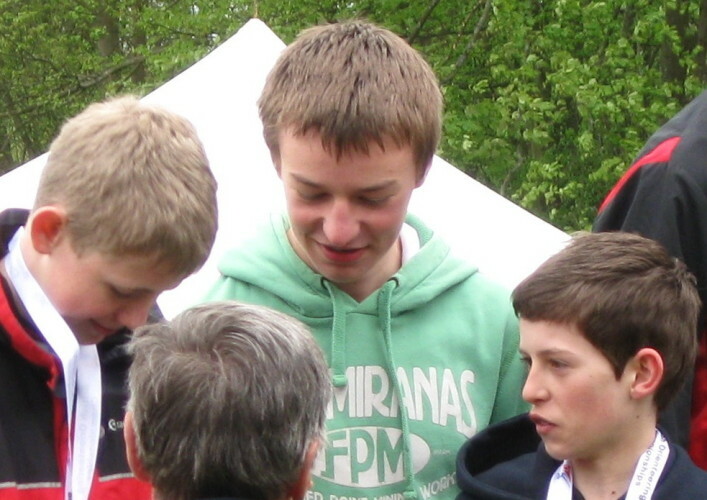 Those that were around when he was a DEE member will recall how enthusuiastic and friendly he always was. 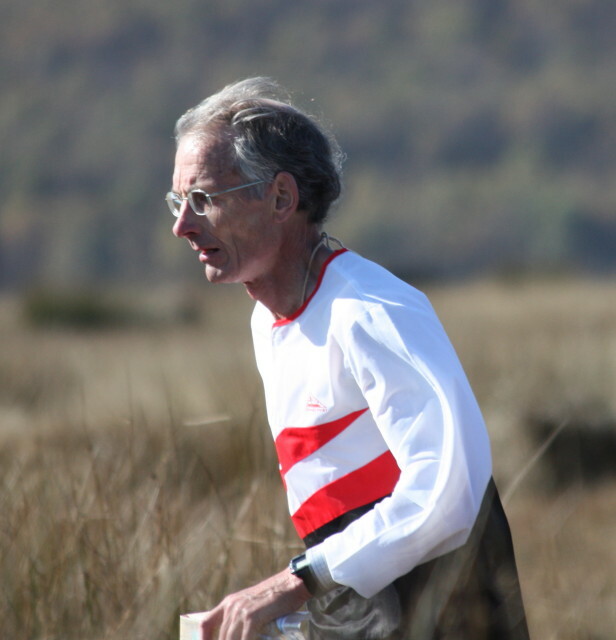 He was still into fell running and a member of Macclesfield Harriers, and their website has a tribute to him which shows that he was still as enthusiastic as ever. 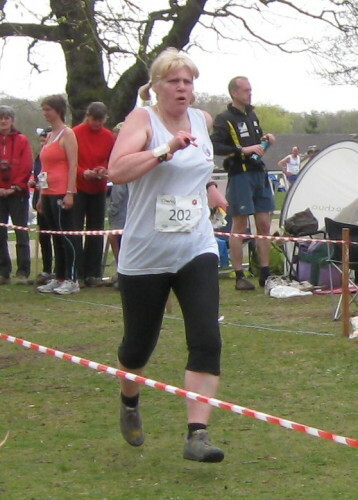 Siân Calow came a close second in W40+. See the final league tables in pdf version or technicolor Excel version. 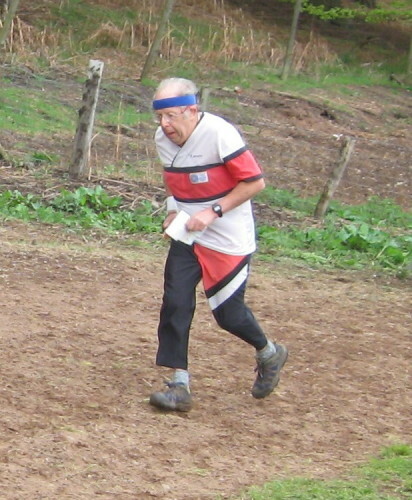 Eight DEEsiders ran in the Southern Championships, staged by NGOC at Lydney (Forest of Dean). What is it that these people know about Sunday morning weather in Frodsham that the rest of us don't? Congratulations to Mike Beasant for winning the M18E class, and to Sara Campbell who won the W45L class ahead of Vicky Thornton (MDOC, who pipped Sara for the Northern title three weeks ago), Karen Nash (SROC) and then Kath Broatch (ERYRI). 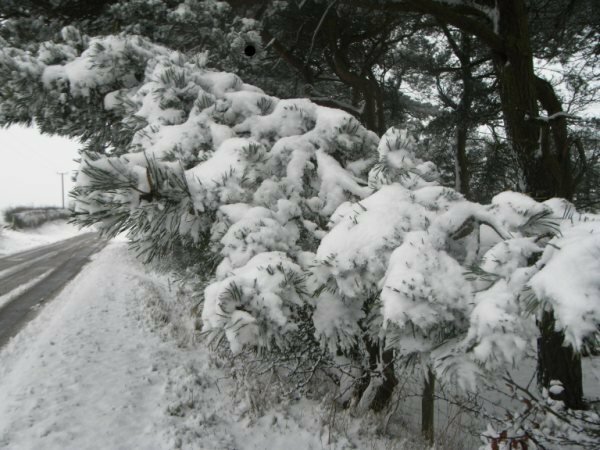 At 07:45 the Organiser couldn't get his car up the road from his house, and the roads to the event parking are steeper than that, so the decision was reluctantly taken to cancel. We are told that the farmer had to tow the milk wagon all the way up the B road leading to the parking at 10:30. 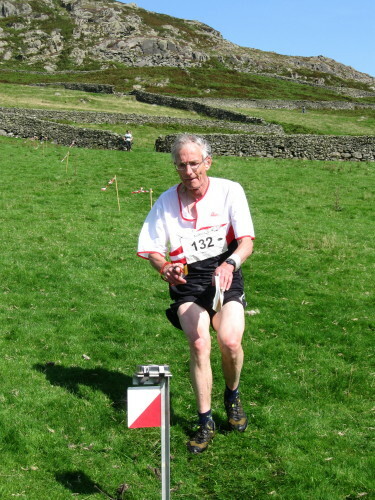 No sooner has Noel won his O boots, than Mike Smithard goes and wins the CompassSport Photo-O competition! 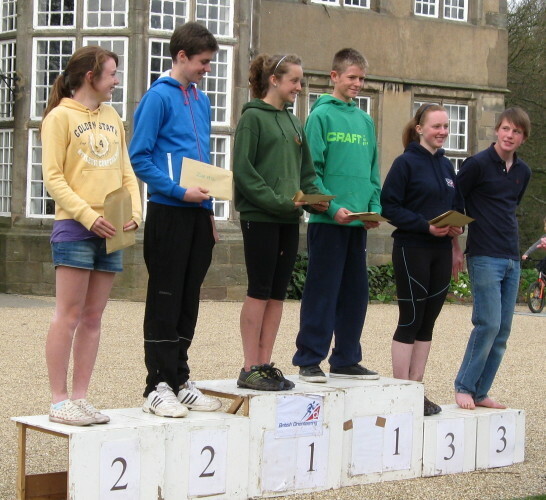 Free entry to the Lakes 5 day - not bad for 10 hours' work [Better hourly rate than civil engineering? Ed]. Mike says you have to be retired to do this competition - and persistent. 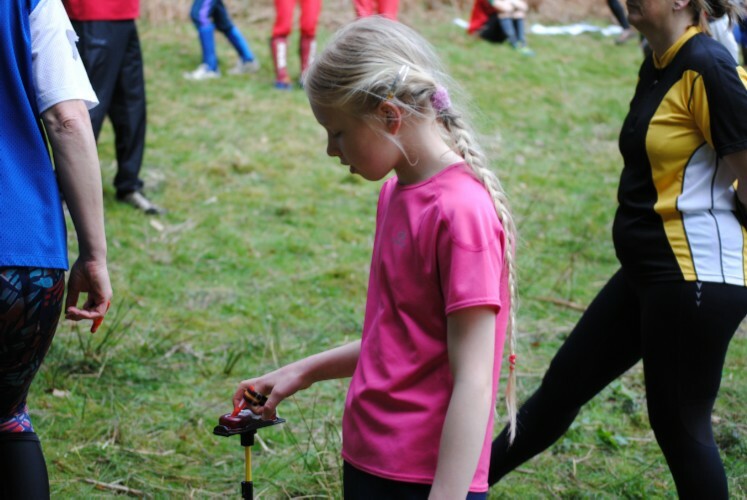 Another great junior weekend - some of the 'old school' not there but over 20 juniors having fun - Orienteering, getting wet, muddy, joining in the games. Plenty of adults and older juniors to supervise/advise and even do a bit of training, plus Sonia Chavasse and Janet Vokes producing the meals to keep us fuelled. Noel and Pauline planned the training, classic technique practice from Noel, contours and contour only maps from Pauline followed by the customary 2 person relay - a bit harder than usual (apologies to parents waiting for them back in the car park - they just insisted on 'going out again' - we collected the controls in in the end). Peace descended just after 11pm on Saturday, and everyone was at breakfast by 8.10 - so top marks for that - prob. a world record! 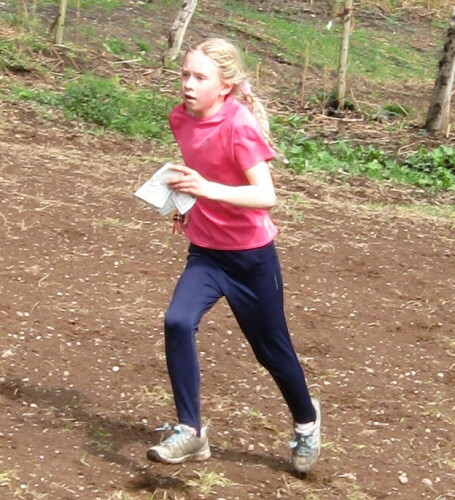 Once again, the youngest girl showed the fastest turn of speed - last year, Hannah Hateley, this year Rosie Davies who ran out of her shoes twice in the relay (though maybe the mud had something to do with it), burning off her 'minder', Mike Beasant, on more than one occasion (photos of that have been suppressed). 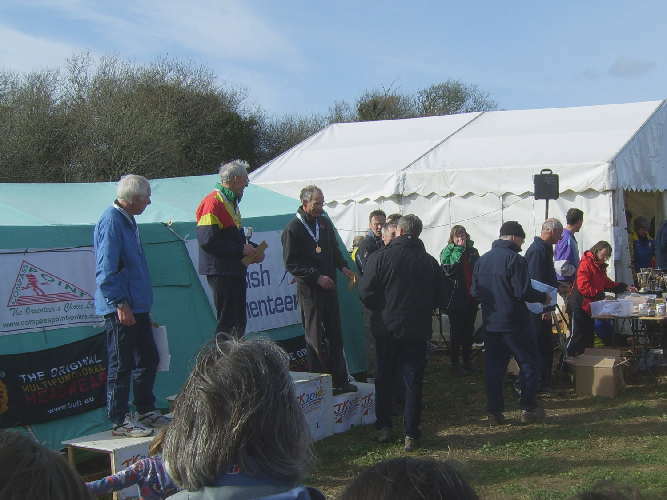 Plenty of cakes - and biscuits for the relay winners to share with the others, it didn't rain or snow, the sun shone some of the time, seems as if most will be back next year for more. Contestants in 'Cupid' competition - names withheld by request. Mike Beasant gets some help from the younger generation. Congratulations to head coach Noel Schorah on winning the Walsh competition in Focus magazine - see the BOF website for details. Noel follows a recent tradition of DEEsiders winning things in competitions - Olly Williams, Margaret Murphy, and now Mike Smithard has retired he's trying to get a prize as well. 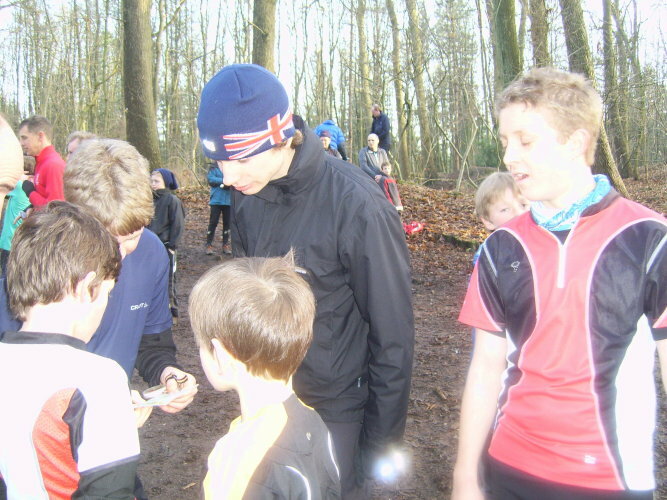 Anyone in the club who is involved with the coaching of juniors needs to have a valid Enhanced CRB Disclosure registered with British Orienteering - they expire three years after their date of issue. 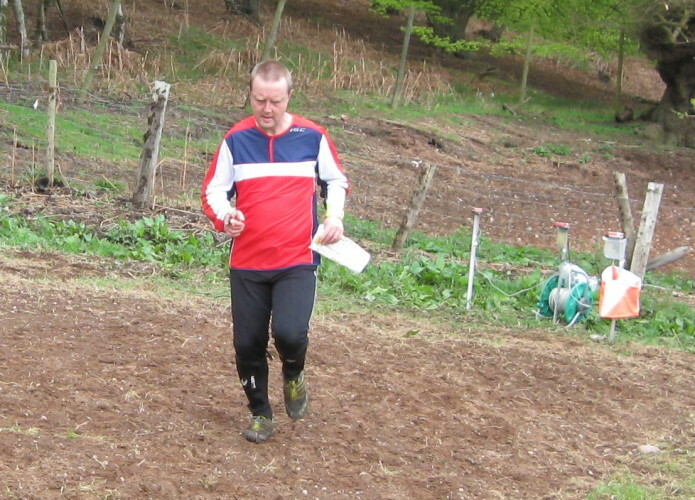 Information about obtaining or renewing a CRB check can be found on the British Orienteering website. 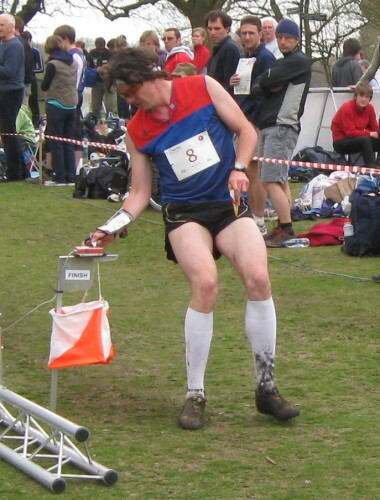 Documents can be sent directly to British Orienteering who will process and return them to you quickly. There are also authorised document checkers; those most local to us are Vicky Thornton (MDOC), Mike Ormerod (SROC), Derek Allison (LOC) and Helena Burrows (ERYRI). The Lakes 5 2010 is getting close. The cheapest entry rates close on 31 January, so if you want to catch them, it's time to enter. 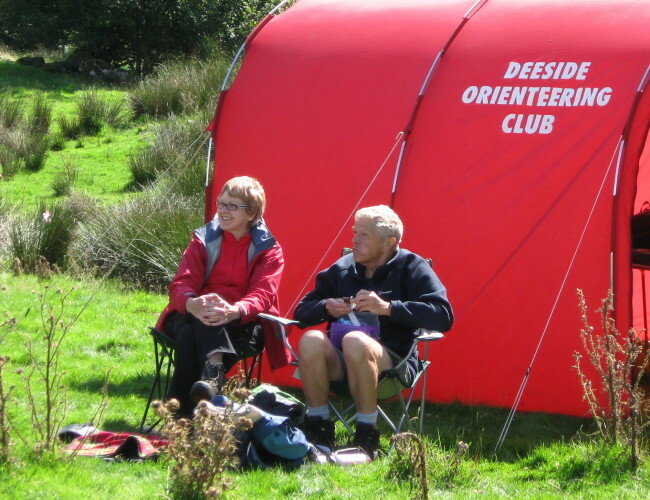 The club's accommodation at Lanehead Outdoor Education Centre, Coniston is filling up, and we are about to open the remaining places to neighouring clubs; so if you haven't booked, and you want to take up this chance to stay in high-quality accommodation with other orienteers, please contact Bob Elmes (dee@elmes.demon.co.uk) without delay. Lanehead is booked from Saturday 21 August to Thursday 26 August 2010 inclusive (departing Friday), i.e. 6 nights. 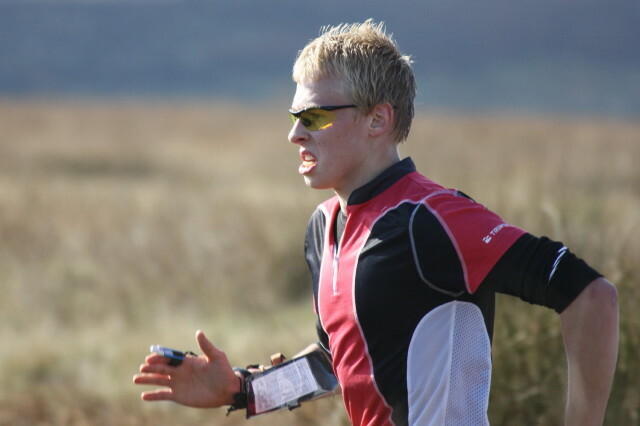 This covers the whole of the Lakes 5 2010 event - training Saturday, individual events Sunday to Friday. 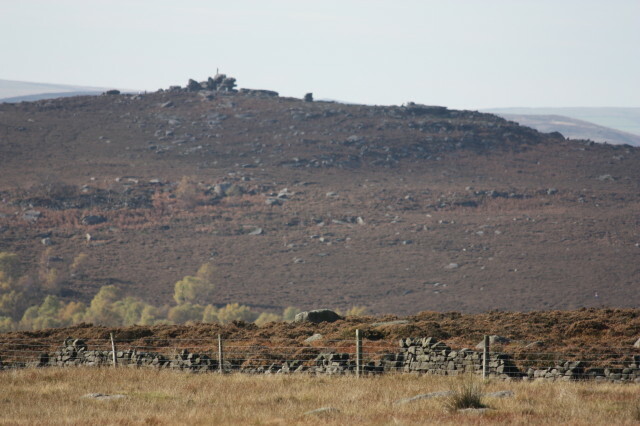 The cost is £96 per person for the 6 nights, payable by 20 February 2010. The centre is on the east side of Coniston Water, extremely handy for days 2, 3 and 4, and pretty good for days 1 and 5. It is for our sole self-catering use, in bunk-bed dormitory accommodation. Large 6-burner gas hob, with plenty of space to use all 6 burners. Very large double gas oven. Several fridges (I counted 4). Commercial dishwasher (washes in 2 minutes - not like the namby-pamby dishwashers you have at home). Plenty of space. Dormitories typically sleep 6 in bunk beds; one dormitory sleeps 8. We will endeavour to satisfy requests for who goes in which dormitory. All dormitories have at least 1 en-suite room (toilet, wash basin, shower); several have 2 such rooms. Additional showers and toilets accessible from the corridor. Serious drying facilities - more than enough to cope with the worst weather. 2 large BBQ stands in garden, plus picnic table. 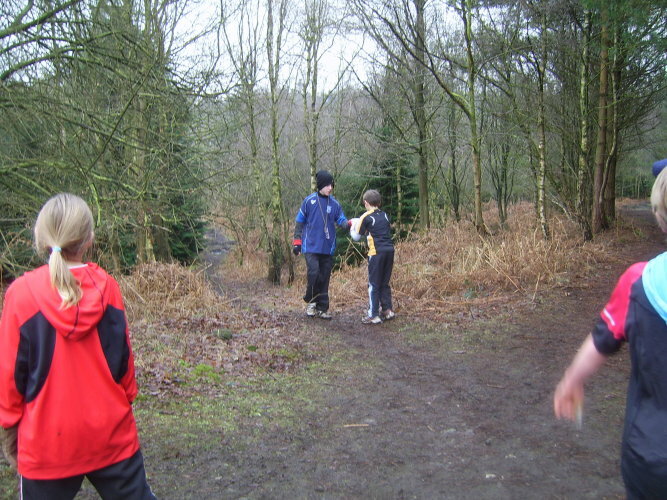 Backs onto Grizedale Forest, with permanent Orienteering (and Mountain Bike Orienteering) courses, mountain bike trails including 10km single- track course. Views across Coniston Water to the Old Man. The centre been recently refurbished to a very high standard, is very comfortable and clean, and our hire includes a daily housekeeper visit for cleaning. Any questions, please contact Bob Elmes (dee@elmes.demon.co.uk) tel. 01928 731946. Deeside News is upon us again. The print date is Sunday 24th January. Thanks for all your contributions for the last edition that made a bumper Xmas edition. I wait to be deluged with your articles and News items; pictures are always welcome. What else would you be doing now we are all trapped indoors by the snow and ice but writing an article for Dee News? Congratulations to Chris Owens on being selected as a travelling reserve for England at the Interland competition in Belgium this March. 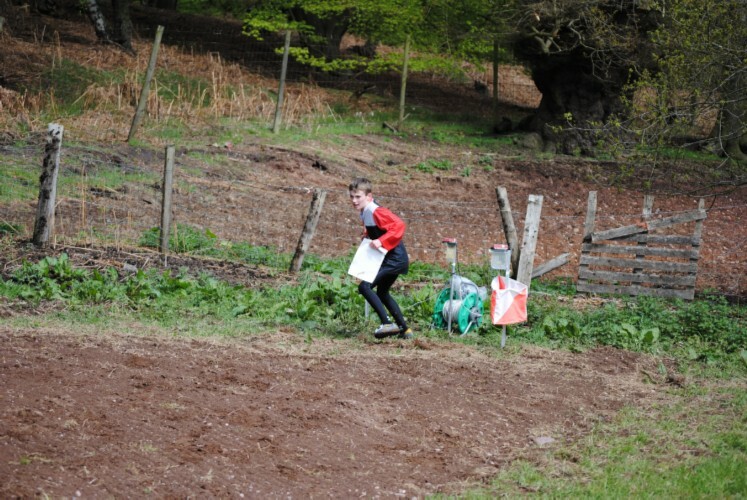 A 'high level' YH this year at High Close (Langdale) with walking and Orienteering straight from the door. Usual arrangements. Full details and booking form available online, or contact Mike Smithard (smithardm@btinternet.com) tel. 01244 380565. Early applications appreciated. Looking for News from 2009? Then try our 2009 News page. Or from 2008? Then see the 2008 News page. Before that? Try the News archive page. 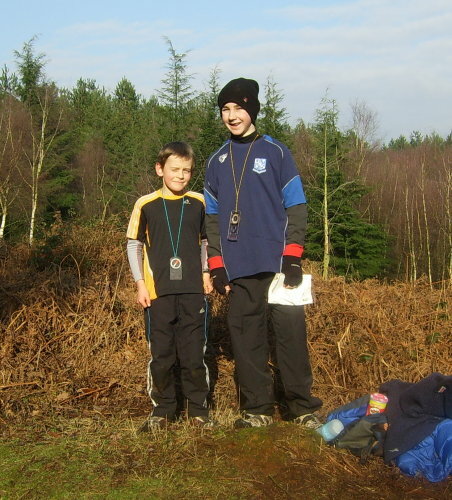 © 2010, Deeside Orienteering Club.